Not to be confused with Chevrolet Bolt EV or Toyota Voltz. The Chevrolet Volt is a plug-in hybrid car manufactured by General Motors, also marketed in rebadged variants as the Holden Volt in Australia and New Zealand, Buick Velite 5 in China, and with a different fascia as the Vauxhall Ampera in the United Kingdom and as the Opel Ampera in the remainder of Europe. Volt production ended in February 2019. Sales of the 2011 Volt began in the United States in mid-December 2010, followed by various European countries and other international markets in 2011. Global combined Volt/Ampera-family sales totaled about 177,000 units by the end of October 2018. The U.S. is the leading market, with 152,144 Volts delivered through the end of 2018, followed by Canada with 16,653 Volts sold through September 2018. Just over 10,000 Opel/Vauxhall Ampera cars had been sold in Europe as of June 2016[update], with the Netherlands leading the European region. As of September 2018[update], the Volt/Ampera family of vehicles is the world's all-time best-selling plug-in hybrid vehicle, and the Volt is also the U.S. all-time top-selling plug-in electric car. The Volt operates as a pure battery electric vehicle until its battery capacity drops to a predetermined threshold from full charge. From there, its internal combustion engine powers an electric generator to extend the vehicle's range as needed. When the engine is running it may be periodically mechanically linked (by a clutch) to a planetary gear set, and hence the output drive axle, to improve energy efficiency. The Volt's regenerative braking also contributes to the on-board electricity generation. Under the United States Environmental Protection Agency (EPA) cycle, the 2013/15 model year Volt all-electric range is 38 mi (61 km), with a combined electric mode/gasoline-only rating of 62 mpg‑US (3.8 L/100 km; 74 mpg‑imp) equivalent (MPG-equivalent). The second-generation Volt's improved battery system and drivetrain increased the all-electric range to 53 miles (85 km), its EPA-rated fuel economy in charge-sustaining mode to 42 mpg‑US (5.6 L/100 km; 50 mpg‑imp), and the combined city/highway fuel economy in all-electric mode to 106 MPG-e, up from 98 MPG-e. Deliveries to retail customers in the U.S. and Canada began in October 2015 as a 2016 model year. The Volt has won several awards, including the 2009 Green Car Vision Award, 2011 Green Car of the Year, 2011 North American Car of the Year, 2011 World Green Car, 2012 European Car of the Year, and 2016 Green Car of the Year. Controversies regarding the Volt include the extent to which the U.S. federal government may have participated in the Volt’s development, which continued through General Motors' 2009 government-led bankruptcy, and concerns about the battery-pack fire risk following a crash test that the National Highway Traffic Safety Administration (NHTSA) performed on a Volt in 2011. At the completion of its investigation, NHTSA concluded that no discernible defect trend exists. The Society of Automotive Engineers' (SAE) definition of a hybrid vehicle states that the vehicle shall have "two or more energy storage systems both of which must provide propulsion power, either together or independently." General Motors has avoided the use of the term "hybrid" when describing its Voltec designs, even after the carmaker revealed that in some cases the combustion engine provided some assist at high speeds or to improve performance. Instead General Motors describes the Volt as an electric vehicle equipped with a "range extending" gasoline-powered internal combustion engine (ICE) as a genset and therefore dubbed the Volt an "Extended Range Electric Vehicle" or E-REV. In a January 2011 interview, the Chevy Volt's Global Chief Engineer, Pamela Fletcher, referred to the Volt as "an electric car with extended range." According to the Society of Automotive Engineers (SAE) definitions, the Volt is a plug-in hybrid vehicle, due to the combination of an internal combustion engine and two electric motors, along with a battery that can accept off-board energy. The Volt operates as a purely electric vehicle for the first 25 to 50 miles (40 to 80 km) in charge-depleting mode. When the battery capacity drops below a pre-established threshold from full charge, the vehicle enters charge-sustaining mode, and the Volt's control system selects the most optimally efficient drive mode to improve performance and boost high-speed efficiency. The Chevrolet Volt concept car debuted at the January 2007 North American International Auto Show, becoming the first-ever series plug-in hybrid concept car shown by a major car manufacturer. 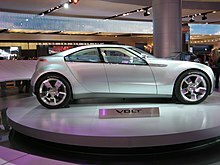 The Volt concept vehicle had four doors with a rear liftgate and seating for four passengers. This was a significant change in design when compared to the General Motors EV1 of the 1990s, which only seated two to reduce weight and to make the necessary room for the lead-acid battery pack. The top speed was also increased on the Volt, from the electronically limited 80 miles per hour (130 km/h) to 100 miles per hour (160 km/h). The battery pack size was reduced, from about 10.6 cu ft (300 L) in volume in the EV1, to 3.5 cu ft (100 L) in the Volt. General Motors' then-Vice-Chairman Robert Lutz said the two-seater sports car being developed by Tesla, the Tesla Roadster (2008), and the rapid advancement of lithium-ion battery technology inspired him to push the carmaker to develop the Volt after the 2006 Detroit Auto Show, overcoming internal opposition. Lutz's initial idea was to develop an all-electric car, but Jon Lauckner, General Motors Vice President for Global Vehicle Development, convinced him that to avoid an expensive battery, range anxiety concerns, and lack of public charging infrastructure, they could use a smaller battery pack with a small gasoline engine driving a generator acting as a backup to extend the range, but without a mechanical connection between the gasoline engine and the drive wheels, so it would be a pure electrically driven vehicle without many of the limitations General Motors learned from the EV1 experience. Most of the Volt initial design parameters defined for the development of the concept car, then referred as the "iCar" in homage to the iPod, were kept throughout the process up to the final production version. A key design parameter was a target of 40 miles (64 km) for the all-electric range, selected to keep the battery size small and lower costs, and mainly because research showed that in the U.S. 78 percent of daily commuters travel 40 miles or less. This target range lets drivers make most travel electrically driven, with the assumption that charging takes place at home overnight. This requirement translated to using a lithium-ion battery pack with an energy storage capacity of 16 kWh considering that the battery would be used until the state of charge (SOC) of the battery reached 30%. This limit to the SOC was necessary in order to maintain operational performance under a wide range of environments, and to minimize the battery degradation to allow at least a ten-year life span. The initial target range for the gasoline engine/generator was set between 250 to 300 miles (400 to 480 km) and the vehicle had to be family size for four or five passengers. Another key design decision was to develop the concept car based on a new family of common powertrain components for electric propulsion, which initially was called the E-Flex Systems, “E” stands for electric drive and “Flex” for the different sources of electricity, but later was renamed Voltec drive system. The E-Flex or Voltec powertrain is an attempt to standardize many components of possible future electrically propelled vehicles, and to allow multiple interchangeable electricity-generating systems. The E-Flex powertrain has the potential to adapt the vehicles to pure battery electric, to fuel cell-powered or to several other sources of energy to create electricity on board, such as engine-generator sets (genset) fueled by gasoline, diesel, biodiesel, ethanol fuel (E100), or flex-fuel (E85). Regenerative braking would also contribute to the on-board electricity generation. In October 2006 the E-flex powertrain was selected for the new propulsion architecture and the name Volt was chosen by General Motors. The Volt concept car became the first application of the E-Flex (Voltec) drive system with a combination of an electric motor, the same used in the Chevrolet Equinox Fuel Cell, a 16 kW⋅h (58 MJ) lithium-ion battery pack with 136 kW of peak power, and a genset consisting of a small 1.0 L, 3-cylinder turbocharged flex-fuel capable engine linked to a 53 kW (71 hp) generator. General Motors called this genset an electric vehicle (EV) range extender. The vehicle was propelled by an electric motor with a peak output of 120 kW (160 hp) delivering 236 lb ft (320 Nm) of motoring torque. The concept car featured several advanced materials from GE Automotive Plastics that helped GM reduce the vehicle weight by up to 50 percent. The Volt concept featured a 12 US gal (45 L; 10.0 imp gal) fuel capacity providing the vehicle a total driving range of around 640 mi (1,030 km), which considered a gasoline fuel efficiency of about 50 mpg‑US (4.7 L/100 km; 60 mpg‑imp) and a 40 mi (64 km) all-electric range. According to General Motors estimates, a daily drive of 60 mi (97 km), combined with an overnight recharge to support the first 40 all-electric miles, would yield an effective gasoline fuel economy of 150 mpg‑US (1.6 L/100 km; 180 mpg‑imp). General Motors also emphasized that the Volt would further reduce dependence on imported oil if E85 ethanol was used instead of gasoline to power the on-board generator engine. Robert Lutz added that if the driver used E85, "the fuel economy figure became 525 miles per (equivalent) petroleum gallon", as only 15% of gasoline is used in this blend. General Motors also noted that actual production of the Volt depended on further battery development, because the required rechargeable batteries needed to make the Volt a viable vehicle did not exist in the market and had yet to be developed. The concept car was actually powered by two 12-volt conventional car batteries, just enough power to allow the vehicle to move at low speeds in the stand. The production design model officially unveiled on September 16, 2008, as part of General Motors centennial celebration at the Wintergarden headquarters in Detroit. The production model differed greatly in design from the original concept car. The carmaker cited necessary aerodynamic changes needed to reduce the concept car's high drag coefficient of Cd=0.43 down to a more efficient Cd=0.28, though still somewhat higher than the Toyota Prius Cd=0.25. Another reason was the use of General Motors' new global compact vehicle platform Delta II to keep costs reasonable, and shared with the 2010 model year Chevrolet Cruze. Another significant difference from the concept car is the seating, as the production Volt seats four rather than five passengers. This change was due to the higher-than-usual central tunnel that runs from the front console to the rear seat that houses the car's T-shaped battery pack. After the concept was put into the pipeline for production, General Motors began looking for a partner to develop the Volt's lithium-ion battery pack. The carmaker evaluated about twenty-five different battery cell chemistries and constructions from around two dozen lithium-ion battery makers around the world. Due to their more promising cell technologies, two companies were selected in June 2007, Compact Power (CPI), which uses a lithium manganese oxide (LiMn2O4) cell made by its parent company, LG Chemical; and Continental Automotive Systems, which uses lithium iron phosphate based cylindrical cells made by A123Systems. By the end of October 2007 CPI (LG Chem) delivered their finished battery pack prototypes, and A123 delivered theirs by January 2008. General Motors testing process was conducted at the laboratory the carmaker had created for the GM EV1 program. The battery packs included monitoring systems designed to keep the batteries cool and operating at optimum capacity despite a wide range of ambient temperatures. To ensure the battery pack would last ten years and 150,000 miles (240,000 km) expected for the battery warranty, the Volt team decided to use only half of the 16 kWh capacity to reduce the rate of capacity degradation, limiting the state of charge (SOC) up to 80% of capacity and never depleting the battery below 30%. General Motors also was expecting the battery could withstand 5,000 full discharges without losing more than 10% of its charge capacity. According to GM, as of August 2016[update], no batteries have been changed due to degradation. In April 2008 General Motors started extensive battery testing. In two years the carmaker put the battery packs to the equivalent of 150,000 real-world miles (240,000 km) and ten years of use. The durability of the battery pack was tested for a broad range of extreme ambient conditions including a shaker table to simulate potholes and a thermal chamber, to simulate temperatures varying from 116 °F (47 °C), typical of the Southwest deserts, to −40 °F (−40 °C) typical of the Alaska tundra. In April 2008 the lithium-ion battery pack was placed in Chevrolet Malibus fitted with the Volt powertrain to be used as test mules for further real-world testing. In October 2008 General Motors chose CPI (LG Chemical) to provide the battery systems for the first production version of the Volt. In July 2008 General Motors confirmed that a non-turbocharged, 1.4 L 4-cylinder engine would be used as the range extender, and that the intention was to build it in Flint, Michigan. In April 2009, General Motors let journalists test the Volt powertrain without the range-extending generator in the body of Chevrolet Cruze sedans that GM used as test mules at the GM Technical Center in Warren, Michigan. The first pre-production test car based on the final Volt design was built in June 2009, in Warren, Michigan, and by October 2009, 80 Volts had been built and were tested under various conditions. On March 31, 2010, the first factory-built Volt was produced at the Detroit Hamtramck Assembly Plant to test the production line and for quality control purposes, both of the tooling and the pre-production vehicles produced before regular production began. Tony Posawatz was the Volt Vehicle Line Director from 2006 to 2012, and he was known as employee #1 and led the team from concept to production. General Motors held a ceremony at its Detroit Hamtramck Assembly Plant on November 30, 2010, to introduce the first Chevrolet Volt off the assembly line. The first Volt built for retail sale was earmarked for display at General Motors' Heritage Center museum in Sterling Heights, Michigan. The second unit was offered at a public auction, with an opening bid of US$50,000 and it was won by Rick Hendrick who paid US$225,000. The proceeds went to fund math and sciences education in Detroit through the Detroit Public Schools Foundation. Deliveries to retail customers in the United States began in mid December 2010. Volt deliveries began in Canada in September 2011. The first deliveries of the Chevrolet Volt in Europe took place in November 2011. The European version of the Volt, the Opel Ampera, was released to retail customers in Europe in February 2012. Deliveries of the right-hand drive Vauxhall Ampera in the UK began in May 2012. The Holden Volt was released in Australia in December 2012. Right side: power inverter on top of the electric motor used for traction; left side: the 1.4 L gasoline engine used as a generator to keep the battery at minimum charge. The 2011 Chevrolet Volt has a 16 kWh / 45 A·h (10.4 kWh usable) lithium-ion battery pack that can be charged by plugging the car into a 120-240 VAC residential electrical outlet using the provided SAE J1772-compliant charging cord. No external charging station is required. The Volt is propelled by an electric motor with a peak output of 111 kW (149 hp) delivering 273 lb⋅ft (370 N⋅m) of torque. Capacity of the battery pack was increased to 16.5 kWh (10.9 kWh usable) for 2013 models, which increased the all-electric range from 35 to 38 mi (56 to 61 km). Other specifications remained the same. The battery pack capacity was increased to 17.1 kWh for 2015 models. This incremental upgrade is likely to reflect in an improvement in range over previous model years, but as of July 2014[update], the 2015 Volt has not been re-certified with the EPA. While driving, after the Volt battery has dropped to a predetermined threshold from full charge, a small naturally aspirated 1.4 L 4-cylinder gasoline fueled internal combustion engine (Opel's Family 0) with approximately 80 hp (60 kW), powers a 55 kW generator to extend the Volt's range. The vehicle also has a regenerative braking system. The electrical power from the generator is sent primarily to the electric motor, with the excess going to the batteries, depending on the state of charge (SOC) of the battery pack and the power demanded at the wheels. Prior to the 2016 model year, the Volt required premium gasoline of (R+M)/2 octane rating of 91 or higher because the higher octane permitted the 10.5:1 compression ratio engine to use more ignition timing advance to maximize fuel efficiency by 5 to 10% compared to regular gasoline. For users who drive mostly in electric mode, and to avoid maintenance problems caused by storing the same gasoline in the tank for months, the 2011 Volt has a sealed and pressurized fuel tank to avoid evaporation. As a result, the fuel filler must be depressurized before opening the tank. Also, the engine management system monitors the time since the engine last ran, and prompts the driver to run past the 40-mile (64 km) all-electric range before recharging to consume some gasoline. If the driver does not run on gasoline, the system automatically runs the maintenance mode, which starts the engine to consume some of the aging fuel and circulate fluids within the engine. A configuration with an E85 flex-fuel capable engine is under development and was expected to be available in 2013. Primary traction electric motor/generator, provides good acceleration for driving at lower speeds and regeneration for braking, its maximum output of 111 kW setting the maximum output of the whole system. Secondary electric motor/generator, works primarily as generator capable of producing 55 kW or when necessary acts as a motor assisting the primary electric motor. Internal combustion engine of 63 kW power, engaged when the batteries reach the predetermined threshold. Single motor electric – The primary motor runs solely on battery power, maximum propulsion power is 111 kW. Dual motor electric – At higher vehicle speeds the secondary motor engages over the planetary gear such that it reduces the speed of the primary motor. This facilitates higher efficiency and better mileage for the combined system, without increasing the maximum power. Single motor extended – The battery reaches its minimum charge, which triggers the combustion engine. The engine drives the secondary motor as a generator, via the charging electronics, to keep the minimum battery charge level. The primary motor can still provide its 111 kW for short acceleration, albeit not sustained. Dual motor extended – The electric motors are used again in dual configuration with increased efficiency at higher speeds. Additionally the gasoline engine contributes propulsion power via the planetary gear. While power is drained from the battery the amount is less than in mode 2 for the same propulsion power, thus extending the range. The drivetrain permits the Volt to operate as a pure battery electric vehicle until its battery capacity has been depleted to a defined level, at which time it commences to operate as a series hybrid design where the gasoline engine drives the generator, which keeps the battery at minimum level charge and provides power to the electric motors. The full charge of the battery is replenished only by loading it on the electrical grid. While in this series mode at higher speeds and loads, (typically above 30 miles per hour (48 km/h) at light to moderate loads) the gasoline engine can engage mechanically to the output from the transmission and assist both electric motors in driving the wheels, in which case the Volt operates as a power-split or series-parallel hybrid. After its all-electric range has been depleted, at speeds between 30 to 70 miles per hour (48 to 113 km/h), the Volt is programmed to select the most efficient drive mode, which improves performance and boosts high-speed efficiency by 10 to 15 percent. While operating modes are switched automatically the Volt allows the driver to choose from three drive modes: normal, sport and mountain. The mountain mode, which is expected to be required only under unusual power demand conditions, increases minimum battery state of charge (SOC) to around 45%, thus maintaining performance on steep and long grades. The driver hears more engine noise due to the higher rate of power generation required to maintain this mode. The sport mode causes the engine to rev higher, and the response to the throttle pedal is quicker. The Ampera has an additional option, the "City Mode" or "battery hold", allowing the driver to save the energy currently stored in the battery for use when traveling in urban areas or restricted zones. The 2013 model year Volt includes a "Hold" option to provide the same choice. The 2011 Volt's lithium-ion battery (Li-ion) battery pack weighs 435 lb (197 kg) and "consists of 288 individual cells arranged into nine modules. Plastic frames hold pairs of lithium-ion cells that sandwich an aluminum cooling fin. The design and construction of that aluminum plate was critical to ensuring an even temperature distribution with no hot or cool spots across the flat, rectangular cell. The battery pack has its own cooling circuit that is similar to, but independent from, the engine cooling system." For the 2011/2012 model years, the battery pack stores 16 kWh of energy but it is controlled or buffered via the energy management system to use only 10.3 kWh of this capacity to maximize the life of the pack. For this reason the battery pack never fully charges or depletes, as the software only allows the battery to operate within a state of charge (SOC) window of 65%, after which the engine kicks in and maintains the charge near the lower level. The minimum SOC varies depending on operating conditions. When the car needs more power, such as in mountain mode, the lower limit of the SOC rises to 45% to ensure enough power is available. The battery capacity was increased to 16.5 kWh for the 2013 model year, the SOC window was increased to use 10.8 kWh of the total battery energy, and the buffer to ensure battery life is not reduced. These changes increases the Volt's all-electric range, but charging takes slightly longer. GM achieved the improved battery performance and durability through minor changes to the material composition of the battery cell chemistry. Despite containing near identical energy (+/- 0.5 kWh), the Volt's battery pack is over 70% lighter than the EV1's original 1,310 lb (590 kg), 16.5 kWh AC Delco lead-acid battery pack, mainly because the Volt uses higher specific energy Li-ion batteries. Li-ion batteries are expected to become less expensive as economies of scale take effect. Because batteries are sensitive to temperature changes, the Volt has a thermal management system to monitor and maintain the battery cell temperature for optimum performance and durability. The Volt's battery pack provides reliable operation, when plugged in, at cell temperatures as low as −13 °F (−25 °C) and as high as 122 °F (50 °C). The Volt features a battery pack that can be both warmed or cooled. In cold weather, the car electrically heats the battery coolant during charging or operation to provide full power capability. In hot weather, the car can use its air conditioner to cool the battery coolant to prevent over-temperature damage. General Motors guarantees the Volt's battery for eight years or 100,000 miles (160,000 km), and cover all 161 battery components. GM estimates that Volt batteries will degrade by 10 to 30% after 8 years or 100,000 miles. GM has applied for a patent that may allow technicians to quickly and cheaply recover some of the performance of degraded battery packs. The Volt’s battery management system runs more than 500 diagnostics at 10 times per second, allowing it to keep track of the Volt’s battery pack in real-time, 85% of which ensure the battery pack is operating safely and 15% monitor battery performance and life. The Volt uses a plug specification published in 2009, SAE J1772-2009, that is considered a standard for electric cars in North America. Depending on in-car settings a full charge takes from approximately 10 hours (12A setting) to as much as 14 hours (8A setting) from a standard North American 120 V, 15 A outlet and about 4 hours from a 240 V AC source and suitable 240 V EVSE. The Volt comes with a 20 ft (6.1 m) charging cord suitable for the standard household power outlet in its country of sale. If plugged in, recharging can be controlled remotely through a smartphone application. To save energy, the Volt sometimes heats the seats instead of blowing heated air through HVAC system, as heating the vehicle's cabin draws significant power, and can even exceed what is needed to move the vehicle on occasions. A power-saving stereo system uses amplifiers that switch on and off rapidly to save power. It uses 50 percent less energy. The system is also lighter because the use of high grade neodymium magnets. The Volt has a top speed of 100 mph (160 km/h). According to Edmunds.com road tests, the Volt's 0 to 60 mph (0–97 km/h) acceleration time is 9.2 seconds running on electric-only mode, and 9.0 seconds with the gasoline engine assisting propulsion. Motor Trend reports the Volt's quarter mile (402 m) time is 16.9 sec at 84.3 mph (135.7 km/h), while Edmunds reports a quarter mile (402 m) time of 16.8 sec at 81.5 mph (131.2 km/h) in electric-only operation, and 16.6 sec at 85.5 mph (137.6 km/h) with the gasoline engine assisting. Motor Trend reports a 60 to 0 mph (97 to 0 km/h) braking distance of 112 ft (34 m) and Edmunds.com of 124 ft (38 m). According to General Motors the Volt's all-electric range with fully charged batteries varies from 25 to 50 miles (40 to 80 km) depending on terrain, driving technique, and temperature. The 2013 model year Volt increased its EPA's rated all-electric range to 38 miles (61 km). The 2014 and 2015 Volt have the same EPA ratings. The Opel Ampera official all-electric range under the EU-approved UN ECE R101 standard for plug-in hybrids is 83 km (52 mi). 2012 Volt EPA/DOT Window sticker showed potential fuel cost saving. The U.S. Environmental Protection Agency (EPA) officially rated the 2011 model year Volt's combined city/highway fuel economy in all-electric mode at 93 miles per gallon gasoline equivalent (MPG-e) (2.5 L gasoline equivalent/100 km; 112 mpg-imp gasoline equivalent) and 94 MPG-e for the 2012 model year. For the 2012 model year, EPA revised the Volt's fuel economy ratings, increasing the combined city/highway rating in all-electric mode from 93 MPG-e to 94 MPG-e, and the highway rating was increased from 90 MPG-e to 93 MPG-e. As a result of its improved battery pack, the 2013 model year EPA rating climbed to a combined city/highway fuel economy of 98 miles per gallon gasoline equivalent (2.4 L gasoline equivalent/100 km; 118 mpg-imp gasoline equivalent). The Opel Ampera official equivalent fuel consumption under the EU-approved UN ECE R101 standard for plug-in hybrids is 1.2 L/100 km (196.0 mpg‑US; 235.4 mpg‑imp) (83.3 km/L). However, a leading Opel engineer prefers saying 169 Wh/km (16.9 kWh/100 km) while battery-powered, and then 20 km/L (5 L/100 km) petrol-powered. The ECE R101 standard weights charge-depleting mode as 76% and gasoline-only driving as 24%. According to Consumer Reports in December 2011, the Chevrolet Volt fuel cost in electric mode was 3.8¢/mile. According to Edmunds.com, the price premium paid for the Volt in 2012, after discounting the US$7,500 U.S. federal tax credit, takes a long time for consumers to recover in fuel savings, often longer than the normal ownership time period. The Volt received a five-star overall crash safety rating from the National Highway Traffic Safety Administration (NHTSA), the highest-possible score. This rating was obtained with NHTSA's New Car Assessment Program for 2011 model year vehicles. In August 2010, General Motors began a training program for first responders when performing rescue duties involving the Chevrolet Volt. .
Due to significant noise reduction typical of vehicles traveling in all-electric mode at low speeds, the Volt is fitted with a manually activated electronic warning sound system called Pedestrian-Friendly Alert System for use when the car is operating at low speeds to alert pedestrians to the car's presence. The second generation Chevrolet Volt was unveiled at the 2015 North American International Auto Show. The second generation Chevrolet Volt was officially unveiled at the January 2015 North American International Auto Show. Retail deliveries began in the United States and Canada in October 2015 as a 2016 model year, with 1,324 units delivered in the U.S. that month. Availability in the American market was limited to California and the other 10 states that follow California’s zero emission vehicle regulations. GM scheduled the second generation as a 2017 model year to be released in the 39 remaining states by early 2016. Manufacturing of the 2017 MY Volt began in February 2016, and the first units arrived at dealerships at the end of February 2016. The 2017 model complies with stricter Tier 3 emissions requirements and was available nationwide. The second generation Volt has an upgraded powertrain with a 1.5-liter engine that uses regular gasoline; the 18.4 kWh battery pack has new chemistry that stores 20% more electrical energy and uses fewer cells, 192 compared with 288 on the 2014 Volt; it uses a new power controller that is integrated with the motor housing; the electric motors weigh 100 lb (45 kg) less and use smaller amounts of rare earth metals. GM engineers explained that the second generation Volt was developed using extensive input from Volt owners. These improvements allow the 2016 Volt to deliver better EPA ratings than the first generation model. The all-electric range was officially rated at 53 mi (85 km), up from 38 mi (61 km) attained by the 2015 Volt. The gains in efficiency allow the second generation Volt to improve its combined fuel economy in gasoline-only (charge-sustaining) mode to 42 mpg‑US (5.6 L/100 km; 50 mpg‑imp), up from 37 mpg‑US (6.4 L/100 km; 44 mpg‑imp) for the previous model. The official second generation Volt's rating for combined city/highway fuel economy in all-electric mode is 106 miles per gallon gasoline equivalent (MPG-e; 2.2Le/100Km), up from 98 MPG-e (2.4Le/Km) for the 2015 first generation model. The combined gasoline-electricity fuel economy rating of the 2016 model year Volt is 77 mpg‑US (3.1 L/100 km; 92 mpg‑imp) equivalent, 82 MPG-e (2.9Le/Km) in city driving and 72 MPG-e (3.3Le/Km) in highway. Both the all-electric range and fuel economy ratings are the same for the 2017 model year Volt. Second generation Voltec 1.5L gasoline-powered engine (left) and power inverter on top of the traction electric motor (right). In April 2013, CEO Daniel Akerson announced that GM expects the second generation Volt to be priced on the order of US$7,000 to US$10,000 lower than the 2013 model year with the same features. The 2016 Volt pricing started at US$33,170 before any government incentives, plus US$825 for destination. The starting price was US$1,175 lower than the 2015 Volt. In California, order books for the second generation Volt were opened on May 28, 2015. In July 2014, Opel announced that due to the slowdown in sales, they would discontinue the Ampera after the launch of the second generation Volt—and that between 2014 and 2018, Opel planned to introduce a successor electric vehicle in Europe. General Motors announced in February 2016 that the all-electric Opel Ampera-e hatchback would go into production in 2017. This is the European version of the Chevrolet Bolt EV. In April 2015, General Motors confirmed that it would not build the second generation Volt in right-hand-drive configuration. Due to low sales, only 246 units had been sold in Australia by mid-April 2015, and they discontinued the Holden Volt once they sold the remaining stock. Energy consumption of 36 kWh per 100 miles. 1. ^ The EPA run tests used a reproducible methodology to produce results that can be compared between vehicles and test sites. Notes: (1) Exchange rates as of December 16, 2012. (2) Price in the Eurozone countries includes VAT. Assembly of the Volt was assigned to Detroit/Hamtramck Assembly plant following the conclusion of the 2007 UAW-GM contract talks. For initial production the gasoline engine is being imported from the Opel engine plant in Aspern, Austria. In November 2010, General Motors began investing US$138.3 million at its engine operations plant in Flint, Michigan to support increased production of the Ecotec 1.4 L engine that is used in the Chevrolet Cruze, the upcoming 2012 Chevrolet Sonic, and the variant used in the Chevrolet Volt. The Flint plant was expected to start production of 400 engines a day in early 2011, ramp up daily production to 800 engines in late 2011, and to increase its capacity to 1,200 a day by late 2012. In May 2011, General Motors decided to invest an additional US$84 million at the Flint plant to further increase 1.4 L engine production capacity. In 2010, General Motors planned an initial production for calendar year 2011 of 10,000 Volts and 45,000 units for 2012, up from the 30,000 units initially announced. In May 2011, the carmaker again raised its production targets, as Volt and Ampera production capacity was increased to 16,000 units in 2011, including 3,500 units for exports and 2,500 demonstration units destined to U.S. dealerships, and the rest for U.S. sales. However, in November 2011 GM's sales chief announced that they would not meet its sales goal of 10,000 vehicles in 2011. Out of the 2012 production, General Motors expected to produce 10,000 Amperas for sale in Europe, 6,000 destined for Opel and 4,000 for Vauxhall in the UK. In addition, 2,000 Volts were available for the region. By early 2012 GM abandoned its sales target to deliver 45,000 Volts in the U.S and instead announced that production in 2012 would depend on demand. By March 2012 the Volt plant has a global production capacity of 60,000 vehicles per year. The Volt's battery cells are produced by LG Chem in South Korea and then shipped to the US, where the battery packs are assembled at a purpose-built facility in Brownstown Charter Township, Michigan owned and operated by General Motors. Compact Power, the North American subsidiary of LG Chem, is building a battery plant in Holland, Michigan to manufacture the advanced battery cells for the Volt and other carmakers, with capacity to produce enough cells for 50,000 to 200,000 battery packs per year. The US$303 million Holland plant was funded by 50% U.S. Department of Energy matching stimulus funds and is planned to open by mid-2012. The 2011 Chevrolet Volt was officially launched on November 30, 2010 at a ceremony at the Hamtramck plant, where the first production unit for retail sale came off the assembly line. The first retail vehicle was delivered to a customer in Denville, New Jersey on December 15, 2010. GM reported it had built 12,400 Volts in total through December 2011. This includes dealers' demo vehicles in North America and Amperas in dealerships in Europe, crash test vehicles and other unavailable Volts owned by GM. GM halted production for about one month at the Detroit/Hamtramck Assembly plant by mid June 2011 to complete some upgrades, including the installation of new tooling, equipment and overhead conveyor systems throughout the facility. These upgrades allowed GM to triple the rate of Volt production and prepared the plant for 2012 Volt and Ampera production. After the plant retooling, the production rate reached 150 units per day four days a week by August 2011. The Volt plant was also down during January 2012 in preparation for building the California lower-emission version. A four-week shutdown due to slow sales took place between March and April 2012. GM said it had around 3,600 Volts in inventory and needed to reduce dealer inventories as production is expected to meet market demand. GM also extended the traditional two-week summer vacation by an extra week at the Hamtramck plant. GM closed its Detroit-Hamtramck plant from September 17 until October 15, 2012, affecting roughly 1,500 workers on downtime while the plant was retooled to assemble the all-new 2014 Chevrolet Impala alongside the 2013 Volt. This was the second time in 2012 that GM has halted Volt production. Production of the 2013 model year Volt began in July 2012 and customer deliveries began during the same month. In October 2012, GM announced they would build the Cadillac ELR extended-range luxury coupe at the Detroit-Hamtramck Assembly plant, together with the Chevrolet Volt, Opel Ampera, and Holden Volt. The addition of the ELR to the plant represents an additional US$35 million investment, bringing the total product investment to US$561 million since December 2009. The first 2014 ELRs rolled off the production line in late May 2013. These were pre-production units destined for testing purposes before production for retail customers began at the end of 2013. Deliveries of the 2014 model year Volt began in August 2013. Volt sales in the U.S. reached the 50,000 unit milestone in October 2013, out of more than 60,000 vehicles of the Volt/Ampera family sold worldwide. Production of the 2015 model year Volt ended in mid-May 2015, while manufacturing of pre-production units of the second generation began in March 2015. In July 2016, Volt sales in the American market passed the 100,000 unit milestone, out of about 117,000 Volt/Ampera family vehicles sold worldwide through June 2016. Volt production ended on February 19, 2019. The final Volt that rolled off the assembly line went the GM Heritage Center in Sterling Heights, Michigan. Sales of the 2011 Chevrolet Volt began in selected markets due to limited initial production, as General Motors' original target for 2011 was 10,000 units. The first cars were delivered in Washington D.C., the New York City metropolitan region, California, and Austin, Texas. By May 2011 the Volt had been launched also in Connecticut, Maryland, Michigan, New Jersey, and Virginia. Deliveries in Delaware, Florida, Georgia, Hawaii, North Carolina, Oregon, Pennsylvania, South Carolina, and Washington began in the third quarter of 2011. In June 2011, Chevrolet dealers nationwide began taking orders for the 2012 Volt, and deliveries in all 50 states began in November 2011. The suggested retail price (MSRP) for the 2011 Chevrolet Volt in the U.S. started at US$40,280. That price excluded destination freight charge, tax, title, license, dealer fees, optional equipment—and savings due to factory incentives, tax deductions, or other subsidies for qualifying buyers. The MSRP for the 2012 Volt starts at US$39,995 including a US$850 destination freight charge and excludes tax, title and license fees, or other available government subsidies. The base price is US$1,005 less than the 2011 model year, and General Motors explained that this price reduction was possible because of a "wider range of options and configurations that come with the expansion of Volt production for sale nationally." The price dropped to US$34,995 including destination charges for the 2014 model year. Due to the capacity of the Volt's battery pack it qualifies for the maximum US$7,500 federal tax credit as specified in the Emergency Economic Stabilization Act of 2008. The federal tax credit phases out over a one-year period after the manufacturer has sold at least 200,000 vehicles in the U.S. Several states also have additional incentives or rebates available for plug-in electric vehicles for qualifying buyers. The 2011 Volt price including all available regular production and premium options is US$44,600, including destination charges and before tax credits or any subsidies. For the 2012 model year the price of the Volt with all available options is US$46,265 before tax credits or any subsidies available. As of October 2018[update], General Motors combined sales of plug-in electric vehicles in the U.S. totaled almost 197,000 units and are expected to pass 200,000 early in 2019. Thereafter, the applicable tax credit reduces gradually until it is completely phased out beginning on January 1, 2020. President Obama driving a Volt at the White House. The price for the home charging units is US$490 plus installation costs. The Voltec is a home-charging unit built by SPX for Volt owners. It is a 240-volt (Level II) charger, and, according to General Motors, can replenish the Volt's batteries in about four hours. Consumer Reports has advised buyers to budget up to US$2,000, as many older homes may need a substantial electrical upgrade because the U.S. National Electrical Code requires that the charger have its own dedicated 220-volt, 30-amp circuit. Early buyers can benefit from the federal tax credit available for charging equipment. The 2011 Volt was not submitted for application to the California Air Resources Board's (CARB) Clean Vehicle Rebate Project rebate and therefore was not required to meet the 10-year 150,000-mile (240,000 km) battery warranty requirement for enhanced advanced technology partial zero-emissions vehicles (enhAT-PZEV). The Volt team explained that for the launch General Motors decided to go with a common national package that includes an 8-year 100,000-mile (160,000 km) battery warranty. For this reason owners of the 2011 Volt did not qualify for California's rebates and free access to use carpool lanes even when traveling solo. A third package, scheduled for 2013, is under development with an E85 flex-fuel engine. General Motors engineering team commented that "introducing two or three packages of an entirely new technology set and platform at the same time wasn't an option." Chevrolet Volt with California's HOV lane access green sticker. In February 2012 General Motors began deliveries of a low emission version destined for California that features a new low emissions package that allows the 2012 Chevrolet Volt to qualify as an enhanced, advanced technology –partial zero emissions vehicle (enhAT-PZEV) and have access to California’s high-occupancy vehicle lanes (HOV). The new standard California version of the Volt features a modified engine and exhaust components. The catalytic converter was modified to add a secondary air-injection pump that "streams ambient air into the exhaust stream to increase its ability to remove pollutants." Owners of a 2012 Volt with the low emissions package are eligible to apply for one of 40,000 available HOV lane stickers issued to vehicles that qualify as a California AT-PZEV. The permits are handed out on a first-apply, first-served basis. Additionally, the new low emissions package makes the 2012 Volt eligible for owners to receive up to US$1,500 in state rebates through the state’s Clean Vehicle Rebate Project (CVRP). This incentive is in addition to the federal government’s US$7,500 tax credit. Only the 2012 Volts manufactured after February 6, 2012, are fitted with the low emission package and sold as standard models in California. Other states where the Volt has solo driving access to HOV lanes are Florida, Georgia, New York and Virginia. Since sales began in December 2010, a total of 152,144 Volts have been sold in the country through December 2018. The Volt ranked as the all-time top selling plug-in electric car in the United States until February 2015, when it was surpassed by the all-electric Nissan Leaf in March 2015. Cumulative Volt sales passed Leaf sales in March 2016, and became once again the best selling plug-in car in the U.S. ever. In July 2016, Volt sales in the American market passed the 100,000 unit milestone. In December 2018 the Volt still ranked as the all-time plug-in electric car in the U.S. while in February 2019 it had been surpassed by the all-electric Tesla Model 3. Production Volts at a test drive event in Washington, D.C. In May 2011 Kelley Blue Book (KBB) projected the 2011 Chevrolet Volt resale value at just over US$17,000 after 36 months, the length of a typical lease, which represents 42% of the car's US$41,000 suggested retail price (MSRP). KBB explains that even though the residual value seems low, the projection considered that the first 200,000 Volts sold qualified for a US$7,500 federal tax credit, which effectively reduces the MSRP to US$33,500, making the US$17,000represent 51% of its original value after the tax credit. In comparison, KBB notes, the 2011 Toyota Prius has a projected residual of 46% after 36 months. KBB's estimate assumed a gasoline price around US$4 per gallon in 2014. For 2012, Kelley Blue Book expected the Volt to retain 42% of its original value after 3 years and 27% after 5 years. Based on these figures, in November 2011 KBB awarded the Volt with the 2012 Best Resale Value Awards in the plug-in electric car category. KBB explains that the residual value for the Volt is lower than the market 35.5% average due to the US$7,500 federal tax credit, which lowers the transaction price and pushes down the residual value. Consumer Reports' analysis show that many Chevrolets lose about half of their purchase price after three years of ownership, and if the Volt depreciates the same, US$17,000 seems a reasonable estimate. However, Consumer Reports have noted that fuel-efficient hybrids and diesel models often depreciate far less than most vehicles, which might increase the Volt's resale value after three years above the US$17,000 estimate. Additionally, if gasoline prices continue to rise or if the tax credits expire, the demand for used Chevrolet Volts could quickly increase, raising their market value. On the other hand, if the next-generation Volt’s battery has twice the capacity and cost less, as General Motors has claimed, the first generation Volts would be obsolete when the new ones come out in 2015. Considering these assumptions, Consumer Reports said, "At this point we believe it’s still unclear how the Volt will fare." General Motors is sponsoring the Pecan Street demonstration project at the Mueller neighborhood in Austin, Texas. The project objective is to learn the charging patterns of plug-in electric car owners, and to study how a residential fleet of electric vehicles might strain the electric grid if all owners try to charge them at the same, which is what the preliminary monitoring found when the plug-in cars return home in the evening. As of June 2013[update], the community has nearly 60 Chevrolet Volt owners alone thanks to GM's commitment to match the federal government's US$7,500 rebate incentive, which halves the purchase price of the Volt. The second generation Volt is only sold in the U.S. and Canada. Chevrolet began taking orders in May 2011 and deliveries began in September 2011 in major cities only. During 2012 the Volt was the best selling plug-in car in Canada, outselling all other PEVs combined. Despite a 24% reduction from 2012 sales, the Volt continued as the top selling PEV in the Canadian market in 2013, and again in 2014. As of September 2018[update], the Volt continued to rank as the all-time top selling plug-in electric car in Canada. Since September 2011, a total of 16,653 new Volts have been delivered in Canada through the end of October 2018. The monthly sales record was set in May 2018 with 731 deliveries. Sales in 2016 set a calendar year record of 3,469 units delivered. The suggested retail price (MSRP) for the 2012 Chevrolet Volt started at CA$41,545 (US$42,423 in June 2011). This excludes any charges, fees, and optional equipment—and is before any available subsidies or incentives for qualifying buyers. The Canadian market offers the Volt in one standard trim level with two option packages: Premium Trim Package and Rear Camera and Park Assist Package. Some provinces are offering Government incentives including Ontario, Quebec (both at CA$8,500 US$8,680) and British Columbia has announced their new LiveSmart BC program in which the Chevrolet Volt qualifies for a CA$5,000 incentive/rebate as well as CA$500 towards charging equipment. The European version of the Volt, the Opel Ampera (known as the Vauxhall Ampera in the United Kingdom), was unveiled at the Geneva Auto Show in March 2009 and also was exhibited at the 2009 Frankfurt Auto Show. Opel developed the battery control modules for the Ampera at the Opel Alternative Propulsion Center Europe in Mainz-Kastel, Germany. The production version of the Ampera was unveiled at the 2011 Geneva Motor Show. The Ampera was assembled at the Detroit/Hamtramck Assembly plant, Michigan. The main differences between the Volt and the Ampera are in their styling. The Ampera has a distinctive front and rear fascia, with a large cut-out in the rear bumper. The Opel Ampera features more stylized alloy wheels as standard, and the side skirts are body-colored rather than black. In the inside there are only minor differences and both versions share the same exact powertrain and battery pack. A key operational difference was that the Ampera has four drive modes, one more than the 2011/12 model year Volt. The additional option is City Mode, which adapts battery management to the needs of commuter travel. City mode or "battery hold" engages the range-extender immediately, allowing to save the energy currently stored in the battery, and when switched off, the range-extender stops and the Ampera is then able to use the energy saved in the battery for pure electric driving, for example for traveling urban areas or restricted zones, such as the European low emission zones or to allow the Ampera to qualify for an exemption of the London congestion charge The 2013 model year Volt included the "Hold Drive" button to allow drivers to conserve battery-pack energy for use at a particular time of their choice. General Motors production target for 2012 was to manufacture 10,000 Amperas for sale in Europe, 6,000 destined for Opel and 4,000 for Vauxhall in the UK, plus an additional 2,000 Volts were to be made available for the region. The carmaker targeted the Ampera for business fleet market and local government agencies, where Opel has a strong customer base, while the Volt is aimed at retail customers. According to Opel, by June 2011 around 5,000 customers across Europe had reserved an Ampera, with fleet or business customers representing 60% of reservations, and a total of 7,000 orders were received by March 2012, with Benelux, Germany and the United Kingdom as the top markets in terms of orders. The first deliveries of the Chevrolet Volt in Europe took place on November 30, 2011, to the U.S. Embassy in France. Distribution of the Opel Ampera to dealerships began in December 2011, but deliveries to customers were delayed until February 2012 because Opel decided to wait until the NHTSA completed its investigation of the Volt's battery fire risk after a crash. Since May 2012 the Vauxhall Ampera is available through the Zipcar carsharing club in London, Bristol, Cambridge and Oxford. Amperas destined for the UK market carry the Vauxhall badge. The Opel/Vauxhall Ampera was Europe's top selling plug-in electric car in 2012 with 5,268 units and captured a 21.5% market share of the region's plug-in electric passenger car segment. As of October 2013[update], the Ampera held a market share of almost 10% of European registration of plug-in electric cars since 2011. The market share in the Netherlands was 40% and 10% in Germany. Ampera sales fell 40% in 2013 to 3,184 cars, and within the plug-in hybrid segment, the Ampera was surpassed in 2013 by the Mitsubishi Outlander P-HEV (8,197), Volvo V60 plug-in (7,437), and the Prius plug-in (4,314). In 2013 the Ampera ranked eighth among Europe's top selling plug-in electric vehicles, and its market share fell to about 5%. During the first five months of 2014, only 332 units had been sold, down 67% from the same period in 2013. In July 2014, Opel announced that due to the slowdown in sales, they would discontinue the Ampera after the second generation Volt launch—and that between 2014 and 2018, they plan to introduce a successor electric vehicle in Europe. Ampera sales totaled 939 units in 2014, and only 215 units during the first nine months of 2015. As of June 2016[update], Opel/Vauxhall Ampera sales totaled just over 10,000 units since 2011, with the Netherlands as the leading market with 5,031 Amperas registered, followed by Germany with 1,542 units, and the UK with 1,250 units registered by the end of June 2015. The Netherlands is also the top selling Volt market in Europe with 1,062 units registered through December 2014, out of about 1,750 Volts sold through 2014. In February 2011 Opel announced they would offer the Ampera throughout the Eurozone for a uniform €42,900 (US$56,920, including VAT. Prices by country still varied due to different trim levels in each market. The Chevrolet Volt also has a uniform price that starts at €41,950 (US$55,660 in May 2012) including VAT. The Opel Ampera is eligible to several subsidies and tax breaks available for plug-in electric vehicles in several European countries. In the UK, the Vauxhall Ampera starts at GB£37,250 (US$60,400 in May 2012) before discounting the GB£5,000 Plug-in Car Grant The Chevrolet Volt was also be available in the UK at GB£33,545 (US$54,400 in May 2012) before the government grant. All Volts in the UK came standard with leather interior. General Motors unveiled the Chevrolet Volt in Shanghai under its Chinese name of 沃蓝达 (Wo Lan Da) in September 2010. The first Volts, out of the 10-vehicle demonstration fleet, arrived in China by late December 2011. The demonstration program is taking place in Beijing, Tianjin and Shanghai. Chevrolet Volt in Anting, Shanghai. The Volt went on sale in China by late 2011 with pricing starting at CN¥498,000 (around US$78,300 as of August 2012[update]) and sales are limited to eight Chinese cities: Beijing, Shanghai, Hangzhou, Suzhou, Wuxi, Guangzhou, Shenzhen and Foshan. GM explained that 13 dealerships were selected in the eight cities, and they were chosen because these "cities have more elites who are inclined to try new technologies and lead the fashion tide." The Buick Velite 5 is a rebadged second generation Chevrolet Volt tailored for the Chinese market. However, according to General Motors, in a move illegal under WTO rules the Chinese government refused the allow Chevrolet Volt owners access to up to US$19,300 in government subsidies available for plug-in vehicles unless GM had agreed to transfer intellectual property to a joint venture with a Chinese automaker for at least one of the Volt’s three core technologies: electric motors, complex electronic controls, and power storage devices, whether batteries or a fuel cell. General Motors negotiated with the Chinese government to let the Volt qualify for the subsidies without the technology transfer, but as of November 2011[update], the subsidies were available only for electric cars made by Chinese automakers. As a result of the high import duties, General Motors reported in August 2012 that sales are minimal, those of a very low-volume car. According to LMC Automotive, a total of 18 Volts have been sold in China through June 2012. In March 2012, General Motors announced that an agreement was signed with the China Automotive Technology and Research Center (CATARC) to manage the Volt demonstration fleet in Beijing and to gather feedback from the fleet usage for one year. The demonstration Volts were scheduled to be delivered in April 2012. The Buick Velite 5 was introduced at the 2017 Shanghai Auto Show, a rebadged second generation Chevrolet Volt tailored for the Chinese market. The Velite 5 will be manufactured in China. Deliveries of the Holden Volt in the Australian market began in December 2012, and the first Volt was delivered to the U.S. Ambassador in Canberra. Pricing starts at A$59,990 (around US$62,598). In November 2011 the first Holden Volt arrived in Australia for a series of evaluation tests. Holden stated that the Volt underwent numerous modifications to better suit it to Australian roads, though the test vehicles were still left-hand drive. The Holden Volt was available through 49 select Holden dealerships throughout metropolitan and rural Australia, with 18 in Victoria, 11 in New South Wales, 9 in Queensland, 7 in Western Australia and 4 in South Australia. A total of 80 Holden Volts were sold during 2012, and 101 units in 2013. A total of 246 had been sold in the country by mid April 2015, with the stock of the first generation almost empty. General Motors announced that it would not build the second generation Volt in right-hand-drive configuration, so the Volt was discontinued in Australia when the remaining stock sold out. General Motors do Brasil announced that it would import from five to ten Volts to Brazil during the first semester of 2011 as part of a demonstration and also to lobby the federal government to enact financial incentives for green cars. If successful, General Motors would adapt the Volt to operate on ethanol fuel, as most new Brazilian cars are flex-fuel. In December 2010, General Motors announced plans to introduce the Volt in limited numbers into Japan in 2011 for technology and market test purposes. Exports for retail sales will depend on the results of this trial. The second generation Volt was released for retail customers in December 2015. Pricing starts at 638,000 pesos (~US$36,880), and it is available in Mexico City, Monterrey, Guadalajara, Querétaro, and Puebla. Sales totaled 36 units and in 2017 and 34 in 2018. The Holden Volt was released in New Zealand through three dealerships, with one in Auckland, Christchurch and Wellington. Deliveries began in late 2012 and pricing starts at NZ$85,000 (around US$71,930). By mid-2015, only 16 units were registered despite a price dropped to NZ$75,000. Due to low sales of the first generation model, the second generation Volt was not available in New Zealand. Combined global Volt/Ampera sales passed the 100,000 unit milestone in October 2015. The Volt/Ampera family was the world's best selling plug-in electric car in 2012 with 31,400 units sold. The Opel/Vauxhall Ampera was Europe's top selling plug-in electric car in 2012 with 5,268 units, representing a market share of 21.5% of the region's plug-in electric passenger car segment. However, during 2013 Ampera sales fell 40%, and the declining trend continued during 2014 and 2015. As of October 2018[update], global Volt/Ampera family sales totaled about 177,000 units since its inception in December 2010, including over 10,000 Opel/Vauxhall Amperas sold in Europe up to December 2015. As of October 2018[update], the Volt family of vehicles ranks as the world's all-time top-selling plug-in hybrid, and it is also the third best selling plug-in electric car in history after the Nissan Leaf (375,000) and the Tesla Model S (253,000). As of December 2018[update], Chevrolet Volt sales are led by the United States with 152,144 units delivered, followed by Canada with 16,653 units through September 2018, and the Netherlands with 1,062 Volts registered through December 2015. Out of the 9,989 Opel/Vauxhall Amperas sold in Europe through December 2015, 5,031 were registered in the Netherlands, 1,542 in Germany, and 1,279 in the UK by the end of September 2015, together representing 78% of Ampera sales. The following tables present retail sales of the Volt and Ampera variants through December 2015 for the top selling national markets by year since deliveries began in December 2010. Demonstration vehicles allocated to dealerships are not included in retail sales reports while they are used for test drives. Canada 5,415 1,463 1,521 931 1,225 275 n.a. Australia 246(1) 7(1) 58 101 80 n.a. United Kingdom 125(2) 1(2) 34 23 67 n.a. France 57 0 0 15 42 n.a. Belgium 40 0 3 37 n.a. Sweden 40 0 0 7 33 n.a. Note: (1) Holden Volt sales through September 2015 in Australia. (2) Chevrolet Volts registered in the UK at the end of June 2015. France 373 6 120(2) 57 190 n.a. Norway 249 2 18 88 141 n.a. Austria 238 3 28 42 165 n.a. Belgium 217 3 13 31 170 n.a. Sweden 147 16 22 21 88 n.a. Note: (1) Vaxhull Amperas registered in the UK at the end of September 2015. (2) Sales in France through June 2014. The Cadillac Converj, unveiled at the 2009 North American International Auto Show, shares the Volt's Voltec powertrain. The Cadillac Converj is a plug-in hybrid concept car first unveiled at the 2009 North American International Auto Show. It incorporated the propulsion system from the Chevrolet Volt, including the Voltec powertrain. In August 2011, General Motors announced it would produce the Converj as the Cadillac ELR. The first 2014 ELRs rolled off the production line in late May 2013. These were pre-production units destined for testing purposes and production for retail customers started at the end of 2013. The ELR was released to retail customers in the U.S. in December 2013. At the 2010 Auto China show General Motors unveiled the Chevrolet Volt MPV5 Concept. The Volt MPV5 is a plug-in crossover hybrid and has a top speed of 100 mph (160 km/h) and an electric range of 32 miles (51 km). The MPV5 integrates design elements from the Volt, with a body style very similar to the Chevrolet Orlando and four inches larger than its predecessor, Chevrolet HHR. The Opel Monza Concept is a four-seat coupe plug-in hybrid concept car with gullwing door unveiled at the 2013 Frankfurt Motor Show. The concept shares the same basic plug-in hybrid setup as the Chevrolet Volt and Opel Ampera, but using a turbocharged 1 L 3-cylinder natural gas-powered engine as its range extender instead of General Motors’ current 1.4 L gasoline engine. According to Opel, this concept is the role-model for the next generation of Opel cars, and because of its modular chassis design, future cars based on it would be able to accommodate gasoline, diesel or electric power. In 2008, General Motors was concerned about how the United States Environmental Protection Agency (EPA) would test the Volt to determine its official fuel economy rating. The controversy centered on whether, by including a gasoline engine, the Volt should be classified as a hybrid rather than an electric car as claimed by General Motors. If tested with the same EPA tests used by other hybrids, the Volt's EPA fuel economy rating would be around 48 mpg‑US (4.9 L/100 km; 58 mpg‑imp) due to the current EPA test for hybrids disallowing vehicles from boosting their mpg rating using stored battery power. General Motors stated that the Volt is an entirely new type of vehicle that the EPA's current fuel economy tests are not suited to rate, and that a new test should be devised for this emerging class of hybrid-electrics. General Motors also advocated for a more simplified mpg calculation method to take into account the range of a plug-in hybrid while running solely on electricity. Because the Volt can travel 40 miles (64 km) on batteries alone, GM argued that most drivers with a daily commute of less than that distance would drive only in electric mode, so long as they recharged their vehicle at work or at home overnight. The EPA official rating issued in November 2010 included separate fuel economy ratings for all-electric mode and gasoline-only mode, with an overall combined city/highway gasoline-electricity fuel economy rating of 60 mpg‑US (3.9 L/100 km; 72 mpg‑imp) equivalent (MPG-e). To address the variability of the fuel economy outcome depending on miles driven between charges, EPA also included in the Volt's fuel economy label a table showing fuel economy and electricity consumed for five different scenarios driven between a full charge, and a never-charge scenario. According to this table the Volt's fuel economy goes up to 168 mpg‑US (1.40 L/100 km; 202 mpg‑imp) equivalent (MPG-e) if driven 45 miles (72 km) between full charges. Also, in recognition of the multiple operating modes that a plug-in hybrid can be built with (all-electric, blended, and gasoline-only), for the new fuel economy and environment label that will be mandatory in the U.S. beginning in model year 2013, EPA and the National Highway Traffic Safety Administration (NHTSA) issued two separate fuel economy labels for plug-in hybrids. One label is for extended-range electric vehicles, like the Chevy Volt, with two modes: all-electric and gasoline-only; and a second label for blended mode that includes a combination of all-electric, gasoline and electric operation, and gasoline only, like a conventional hybrid vehicle. In August 2009, General Motors released its estimated city fuel economy rating for the Volt of 230 mpg‑US (1.0 L/100 km; 280 mpg‑imp) of gasoline plus 25 kWh/100 mi (560 kJ/km) of electricity using the EPA's proposed method for evaluating plug-in hybrids. The U.S. Environmental Protection Agency (EPA) issued a statement clarifying that the "EPA has not tested a Chevy Volt and therefore cannot confirm the fuel economy values claimed by GM." In July 2010, GM explained that their estimate was based on a formula that had not been officially approved and that they had been awaiting the EPA's decision on how the equivalent fuel economy of plug-in hybrids would be estimated. The official EPA rating was issued in November 2010 and became the agency's first fuel economy label for a plug-in hybrids. The EPA rated the 2011 Volt combined fuel economy at 93 miles per gallon gasoline equivalent (MPG-e) in all-electric mode, and 37 mpg‑US (6.4 L/100 km; 44 mpg‑imp) in gasoline-only mode, for an overall combined fuel economy rating of 60 mpg‑US (3.9 L/100 km; 72 mpg‑imp) equivalent (MPG-e). The label also shows the combined city-highway fuel economy in all-electric mode expressed in traditional energy consumption units, rating the Volt at 36 kWh per 100 miles (160 km). In 2009, the Presidential Task Force on the Auto Industry said that "GM is at least one generation behind Toyota on advanced, “green” powertrain development. In an attempt to leapfrog Toyota, GM has devoted significant resources to the Chevy Volt" and that "while the Chevy Volt holds promise, it is currently projected to be much more expensive than its gasoline-fueled peers and will likely need substantial reductions in manufacturing cost in order to become commercially viable." A 2009 Carnegie Mellon University study found that a PHEV-40 will be less cost effective than a HEV or a PHEV-7 in all of the scenarios considered, due to the cost and weight of the battery. Jon Lauckner, a Vice President at General Motors, responded that the study did not consider the inconvenience of a 7 miles (11 km) electric range and that the study's cost estimate of US$1,000 per kWh for the Volt's battery pack was "many hundreds of dollars per kilowatt hour higher" than what it costs to make today." In early 2010, it was reported that General Motors would lose money on the Volt for at least the first couple of generations, but it hoped the car would create a green image that could rival the Prius. After the Volt's sales price was announced in July 2010, there was concern expressed of the launch price of the Volt and its affordability and resulting popularity, especially when the federal subsidies of US$2.4 billion were taken into account in the development of the car. General Motors CEO Edward Whitacre Jr. rejected as "ridiculous" criticism that the Volt's price is too expensive. He said that "I think it's a very fair price. It's the only car that will go coast to coast on electricity without plugging it in, and nobody else can come close." Despite the federal government being the major GM shareholder due to the 2009 government-led bankruptcy of the automaker, during a press briefing at the White House a Treasury official clarified that the federal government did not have any input on the pricing of the 2011 Chevrolet Volt. There have also been complaints regarding price markups due to the initial limited availability in 2010 of between US$5,000 to US$12,000 above the recommended price, and at least in one case a US$20,000 mark up in California. Even though the carmaker cannot dictate vehicle pricing to its dealers, GM said that it had requested its dealers to keep prices in line with the company’s suggested retail price. In May 2011 the National Legal and Policy Center announced that some Chevrolet dealers were selling Volts to other dealers and claiming the US$7,500 federal tax credit for themselves. Then the dealers who bought the Volts sell them as used cars with low mileage to private buyers, who no longer qualify for the credit. General Motors acknowledged that 10 dealer-to-dealer Volt sales had taken place among Chevrolet dealers, but the carmaker said they do not encourage such practice. In September 2012, Reuters published an opinion/editorial article where it claimed that General Motors, nearly two years after the introduction of the car, was losing US$49,000 on each Volt it built. The article concluded that the Volt is "over-engineered and over-priced" and that its technological complexity has put off many prospective buyers, due to fears the car may be unreliable. GM executives replied that Reuters' estimates were significantly flawed as they also allocated the vehicle's research and development program costs only against the number of Volts sold in the United States (as of August 2012[update]), instead of spreading the total costs over the entire lifetime of the model, as well as including those units sold in Europe and other countries. GM explained that the investments will pay off once the innovative technologies of the Volt are applied across multiple current and future products. Chevrolet Volt that caught fire after the pole test in June 2011. Top: before the NHTSA's pole test. Below: After the fire. 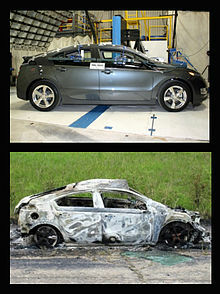 In June 2011 a Volt that had been subjected by the National Highway Traffic Safety Administration (NHTSA) to a 20 mph (32 km/h) side pole impact crash test followed by a post-impact rollover, caught fire three weeks later in the test center parking lot, burning nearby vehicles. The battery was found to be the source of the fire. After the fire, both Chevrolet and the NHTSA independently replicated the crash test and a subsequent vehicle rotation procedure to test for any fluid leakage, but in their first attempt they could not reproduce the conditions under which the battery pack ignited. The NHTSA said it had "concluded that the crash test damaged the Volt’s lithium-ion battery and that the damage led to a vehicle fire that took several weeks to develop." In further testing of the Volt's batteries carried out by NHTSA in November 2011, two of the three tests resulted in thermal events. One battery pack was rotated 180 degrees within hours after it was impacted and began to smoke and emit sparks after rotation. In the other case, the battery pack that was crashed-tested one week earlier and that had been monitored since the test caught fire. The NHTSA then took an uncommon step on November 25, 2011 and opened a formal safety defect investigation "without any data from real-world incidents" to examine the potential risks involved from intrusion damage to the battery pack in the Chevrolet Volt. After the initial Volt fire, the NHTSA examined the Nissan Leaf and other plug-in electric vehicles and said its testing "has not raised safety concerns about vehicles other than the Chevy Volt." Chevrolet Volt after being subjected to the NCAP pole test on May 12, 2011 at MGA Research's test facility. As a result of this investigation, GM announced that it would offer any new GM car in exchange to any Volt owner who has concerns while the federal investigation was taking place. In December 2011, the company said that if necessary they were prepared to recall all the vehicles and repair them upon determination of the cause of the fires, and also announced they would buy back the car if the owner was too afraid of the potential for a fire. GM's CEO also said that it may be necessary to redesign or make changes to the battery pack depending on the recommendations from federal officials. As of December 1, 33 Volt owners in the U.S. and 3 in Canada had requested a loaner car. As of December 5, General Motors reported that a couple dozen Volt owners had requested the carmaker to buy back their cars, and the company had already agreed to repurchase about a dozen. Before the carmaker agrees to buy back each vehicle, other options are explored as GM primarily wants to provide loaner cars, but "if the only way we can make them happy is to repurchase it, then we will," a GM spokesman said. General Motors explained that the buy back price includes the Volt purchase price, plus taxes and fees, less a usage fee based on how many miles the car has been run. As of January 5, 2012, GM reported that around 250 Volt owners had requested either a loaner vehicle or a potential buyback. The NHTSA also said it was working with all automakers to develop postcrash procedures to keep occupants of electric vehicles and emergency personnel who respond to crash scenes safe. Additionally, NHTSA advised to be aware that fires may occur a considerable amount of time after a crash. General Motors said the first fire would have been avoided if GM's protocols for deactivating the battery after the crash had been followed. These protocols had been used by GM since July 2011 but were not shared with the NHTSA until November 2011. In another statement the carmaker stated that they "are working with other vehicle manufacturers, first responders, tow truck operators, and salvage associations with the goal of implementing industrywide protocols." Customer deliveries of the Opel Ampera in Europe were delayed until the NHTSA completed its investigation of the Volt's battery fire risk to make sure the vehicle is safe. However, deliveries of the first Chevrolet Volts in Europe began in France in November 2011. Deliveries of the Vauxhall Ampera in the UK continued as scheduled for May 2012. Opel Ampera deliveries began in February 2012. On January 5, 2012, General Motors announced that it would offer a customer-satisfaction program to provide modifications to the Chevrolet Volt to reduce the chance that the battery pack could catch fire days or weeks after a severe accident. The carmaker described the modifications as voluntary enhancements and stated that neither the car nor the battery was being recalled. General Motors determined the June fire was the result of a minor intrusion from a portion of the vehicle into a side section of the battery pack. This intrusion resulted in a small coolant leak inside the battery of approximately 50 mL (1.8 imp fl oz; 1.7 US fl oz). When the vehicle was put through a slow roll, where it was rotated at 90-degree increments, holding in each position for about five minutes, an additional 1 liter (0.22 imp gal; 0.26 U.S. gal) of coolant leaked. With the vehicle in the 180 degrees position (upside down), the coolant came in contact with the printed circuit board electronics at the top of the battery pack and later crystallized. Three weeks later this condition, in combination with a charged battery, led to a short circuit that resulted in the post-crash fire. General Motors explained the modifications will enhance the vehicle structure that surround the battery and the battery coolant system to improve battery protection after a severe crash. The safety enhancements consist of strengthening an existing portion of the Volt’s vehicle safety structure to further protect the battery pack in a severe side collision; add a sensor in the reservoir of the battery coolant system to monitor coolant levels; and add a tamper-resistant bracket to the top of the battery coolant reservoir to help prevent potential coolant overfill. The additional side safety structural pieces have a total weight of 2 to 3 lb (0.91 to 1.36 kg), and their function is to spread the load of a severe side impact away from the battery pack, reducing the possibility of intrusion into the pack. During December 2011, GM conducted four crash tests of Volts with the reinforced steel and upgraded cooling system, resulting in no intrusion to the battery and no coolant leakage. On December 22, 2011, the NHTSA also subjected a modified Volt to the same test that led to the original fire, with no signs of the damage that is believed to have been the cause. The NHTSA said "the preliminary results of the crash test indicate the remedy proposed by General Motors today should address the issue of battery intrusion" though its investigation remained open. General Motors declined to say how much the modifications would cost. All 12,400 Chevrolet Volts produced until December 2011, including all Amperas in stock at European dealerships, were scheduled to receive the safety enhancements. Since production was halted during the holidays, the enhancements were in place when production resumed in early 2012. Sales continued, and dealers modified the Volts they had in stock. General Motors sent a letter to Volt owners indicating that they could schedule the service appointment to protect their batteries beginning in the last week of March 2012. General Motors also decided to replace the 120-volt charging cords in most of the nearly 10,000 Volts sold since late 2010. The new cords were enhanced to add durability, and some of the chargers built after February 5 have the new cords. On January 20, 2012, the National Highway Traffic Safety Administration closed the Volt's safety defect investigation related to post-crash fire risk. The agency concluded that "no discernible defect trend exists" and also found that the modifications recently developed by General Motors are sufficient to reduce the potential for battery intrusion resulting from side impacts. The NHTSA also said that "based on the available data, NHTSA does not believe that Chevy Volts or other electric vehicles pose a greater risk of fire than gasoline-powered vehicles." The agency also announced it has developed interim guidance to increase awareness and identify appropriate safety measures regarding electric vehicles for the emergency response community, law enforcement officers, tow truck operators, storage facilities and consumers. The chairman of the Subcommittee on Regulatory Affairs, Stimulus Oversight and Government Spending, U.S. Representative Jim Jordan held hearings on January 25, 2012, to investigate why the NHTSA opened a formal investigation only five months after the first postcrash battery fire occurred in June. The subcommittee of the House Committee on Oversight and Government Reform wanted to determine if government officials, including from NHTSA, purposely held back information on the Volt fire for political reasons. Both Daniel Akerson, General Motors CEO, and David L. Strickland, NHTSA administrator, denied any wrongdoing. 2009 Green Car Vision Award by the Green Car Journal at the Washington Auto Show for "a bold and far-reaching approach that promises to bring an exceptionally fuel efficient model to consumers at reasonable cost." 2011 Car and Driver Ten Best Cars. For the first time ever Car and Driver magazine included an electrically powered car among its 10 best. The Chevrolet Volt won the 2011 Motor Trend Car of the Year award. 2011 Motor Trend Car of the Year. The magazine commented that "In the 61-year history of the Car of the Year award, there have been few contenders as hyped – or as controversial – as the Chevrolet Volt." 2011 Green Car of the Year by Green Car Journal. The magazine editors explained that "This award welcomes a new genre of mass-production electric vehicles to the consumer market, with the Volt as the first-ever electric vehicle to take top prize." 2011 Automobile of the Year by Automobile Magazine. The editors commented that the Volt "...is genuinely an all-new car, in the most simplistic sense as well as in the greater notion that the Volt is unlike any vehicle we have ever driven." 2011 North American Car of the Year announced at the 2011 North American International Auto Show. Forty-nine American and Canadian automobile writers chose the Volt. The nominees were judged based on "innovation, design, safety, handling, driver satisfaction and value". Listed among the 2011 Greenest Vehicles of the Year by the American Council for an Energy-Efficient Economy. Listed among the 2011 Best Green Cars by Mother Earth News. 2011 Edison Award - Gold in the Transportation Category, Personal Transportation Segment. 2012 Best Resale Value Award in the category of electric cars by Kelley Blue Book. 2011 The Volt ranked first in Consumer Reports' list of owner-satisfaction based on its 2011 Annual Auto Survey, with 93% respondents who owned the Volt saying they definitely would purchase that same vehicle again. The magazine noted that the Volt had been on sale for just a few months at the time of the survey, and also clarified that the survey took place before the National Highway Traffic Safety Administration investigation regarding the Volt's battery fire risk. 2012 Total Cost of Ownership Award in the electric car category, granted by Kelley Blue Book for the lowest projected costs during initial five-year ownership period in its category. 2012 The Volt ranked first, for a second year in a row, in Consumer Reports' list of owner-satisfaction based on its 2012 Annual Auto Survey, with 92% respondents who owned the Volt saying they definitely would purchase that same vehicle again. 2016 Green Car of the Year by Green Car Journal (awarded to the second generation Volt). The Chevrolet Volt is the first model to receive this award more than once. 2009 Festival Automobile International awarded the Grand Prize for Environment to the Volt. 2011 World Green Car announced at the 2011 New York Auto Show. 2012 International Engine of the Year Award in the category of Green Engine, shared by the Opel Ampera and the Chevrolet Volt for their 1.4 L engine-based extended-range electric powertrain. 2011 Overall Winner of What Car? Green Awards, granted by the UK magazine to the Vauxhall Ampera. 2011 Top Gear's "Green Car of the Year 2011" to the Vauxhall Ampera. 2012 Car of the Year in Denmark. In October 2011, 18 Danish motor journalists chose the Opel Ampera as "Car of the Year 2012" by a wide margin, despite being more expensive than the family cars the award usually goes to. 2012 European Car of the Year, shared by the Chevrolet Volt and the Opel/Vauxhall. The Ampera/Volt became the first car developed in the U.S. to win this European award. 2013 Green Mobility Trophy. Readers of Auto Zeitung in Germany awarded the Opel Ampera the trophy and named the mid-size sedan the best electric vehicle. 2012 Drive's Green Innovation Award to the Holden Volt, as part of the Australia's Drive Car of the Year Awards. ^ a b c "Final Chevrolet Volt Heads To GM Heritage Center". GM Authority. 2019-02-28. Retrieved 2019-03-02. ^ a b c "2011 Volt Specs and Features". Chevrolet. General Motors Company. 2011. Archived from the original on 2011-02-23. Retrieved 2011-01-03. ^ Miller, Michael A.; Holmes, Alan G.; Conlon, Brendan M.; Savagian, Peter J. (2011-04-12). "The GM "Voltec" 4ET50 Multi-Mode Electric Transaxle". SAE International - Technical Papers. doi:10.4271/2011-01-0887. Retrieved 2011-10-30. ^ a b c "Plug Standard Needed For Electric Car-Charging Cord Interface: SAE J1772". 2009-03-30. Retrieved 2009-04-06. ^ a b c d e Voelcker, John (2012-06-07). "2013 Chevy Volt Gets 38-Mile Electric Range, Higher 98-MPGe Rating". Green Car Reports. Retrieved 2012-06-09. ^ a b Jeff Cobb (2014-07-06). "2015 Volt Gets Larger 17.1-kWh Battery". HybridCars.com. Retrieved 2014-07-24. ^ a b c d Mike Millikin (2015-01-12). "Next-gen Chevy Volt EREV is more efficient, with 50-mile electric range". Green Car Congress. Retrieved 2015-01-12. ^ a b c U. S. Environmental Protection Agency and U.S. Department of Energy (2015-06-09). "2013 and 2014 and 2015 Chevrolet Volt". Fueleconomy.gov. Retrieved 2015-06-09. ^ a b c d e "Volt receives EPA ratings and label: 93 MPG-e all-electric, 37 mpg gas-only, 60 MPG-e combined". Green Car Congress. BioAge Group. 2010-11-24. Retrieved 2010-11-24. ^ a b c d Jeff Cobb (2015-08-04). "2016 Chevrolet Volt Rated For 53 Miles Electric Range". HybridCars.com. Retrieved 2015-08-04. ^ General Motors 2012, pp. 9–54. ^ "Chevy Volt discontinued: Chevrolet's last Volt rolls off the assembly line". CBS News. 2019-02-22. Retrieved 2019-03-02. ^ a b c Pontes, Jose (2018-11-30). "Global All-Time Top 5 (Until Oct. '18)". EVSales.com. Retrieved 2018-12-01. ^ a b Niedermeyer, Edward (2010-08-01). "G.M. 's Electric Lemon". The New York Times. The New York Times Company. Opinion. Retrieved 2010-08-01. ^ a b Broder, John (2012-03-24). "The Electric Car, Unplugged". The New York Times. Retrieved 2012-06-13. ^ a b "Ex-GM Honcho Bob Lutz Defends Embattled Chevrolet Volt". USA Today. 2012-03-13. Retrieved 2012-06-13. ^ a b c "Defect Investigations Results - NHTSA Action Number : PE11037". Safercar.gov. 2011-11-25. Retrieved 2011-11-27. ^ a b Bunkley, Nick; Vlasic, Bill (2012-01-20). "In Fire Investigation, Regulators Say They Found No Defect in Volt". The New York Times. Retrieved 2012-01-21. ^ a b "NHTSA concludes safety defect investigation into post-crash fire risk of the Volt". Green Car Congress. 2012-01-20. Retrieved 2012-01-21. ^ "SAE paper 2008-01-0458: The Electrification of the Automobile: From Conventional Hybrid, to Plug-in Hybrids, to Extended-Range Electric Vehicles" (PDF). Society of Automotive Engineers (SAE). 2008. Retrieved 2011-05-14. ^ Stenquist, Paul (2010-10-11). "G.M. 'Officially' Introduces 2011 Chevrolet Volt Amid Controversy". The New York Times. Wheels. Retrieved 2010-10-11. ^ Chang, Richard S. (2009-06-25). "Chevrolet Volt Hits Road, Ahead of Schedule". The New York Times. Wheels. Retrieved 2011-06-02. ^ Oosting, Jonathan (2010-10-12). "Is the Chevrolet Volt a True Electric Car? General Motors Defends EV Label". MLive.com. Retrieved 2010-06-02. ^ Kuchment, Anna (January 2011). "Practically Green: A Q&A with the Chevy Volt's Chief Engineer". Scientific American. Nature America. 304 (1): 25. doi:10.1038/scientificamerican0111-25a. ISSN 0036-8733. Retrieved 2011-03-27. ^ a b c d e f g Mayersohn, Norman (2010-10-01). "Sorting Myth From Fact as Volt Makes Its Debut". The New York Times. Retrieved 2010-10-17. ^ Markus, Frank (2010-10-10). "Unbolting the Chevy Volt to See How It Ticks". Motor Trend. Retrieved 2010-10-11. ^ a b Voelcker, John (January 2007). "Lithium Batteries for Hybrid Cars". IEEE Spectrum. Archived from the original on 2011-05-21. Retrieved 2011-05-14. ^ a b c d "GM Introduces E-Flex Electric Vehicle System; Chevrolet Volt the First Application". Green Car Congress. BioAge Group. 2007-01-06. Retrieved 2011-05-14. ^ Edsall 2010, p. 43. ^ "Bob Lutz: The Man Who Revived the Electric Car". Newsweek.com. Retrieved 2014-01-06. ^ Edsall 2010, pp. 91–16. ^ Fletcher 2011, pp. 4,5. ^ Friend, Tad (2009-01-07). "Elon Musk and electric cars". The New Yorker. Retrieved 2009-09-14. All the geniuses here at General Motors kept saying lithium-ion technology is 10 years away, and Toyota agreed with us—and boom, along comes Tesla. So I said, 'How come some tiny little California startup, run by guys who know nothing about the car business, can do this, and we can't?' That was the crowbar that helped break up the log jam. ^ a b c Edsall 2010, pp. 91-16. ^ "GM to unveil Volt electric concept car". msnbc.com. Associated Press. 2007-01-07. Retrieved 2011-05-15. ^ a b Edsall 2010, pp. 29–33. ^ a b Abuelsamid, Sam (2007-01-07). "A Look at the GM E-Flex Platform". Autoblog Green. Retrieved 2011-05-15. ^ Edsall 2010, pp. 35. ^ a b Fletcher 2011, pp. 73, 74. ^ Lutz, Bob (2011). Car Guys vs. Bean Counters: The Battle for the Soul of American Business. Portfolio Hardcover, Penguin Group. ISBN 978-1-59184-400-6. Location 2234 Kindle edition. ^ "Chevrolet Volt Leads General Motors Into Its Second Century" (PDF). General Motors Company. 2008-09-16. Archived from the original (PDF) on 2012-03-24. Retrieved 2009-12-21. ^ Patton, Phil (2008-12-19). "Edgy, Yet Still Aerodynamic". The New York Times. Retrieved 2011-05-15. ^ Sherman, Don (September 2011). "2011 Chevrolet Cruze Eco". Car and Driver. Retrieved 2012-02-21. ^ Edsall 2010, p. 71. ^ Motavalli, Jim (2008-09-21). "G.M. Tones Down the Volt". The New York Times. The New York Times Company. Retrieved 2011-05-15. ^ a b c d Edsall 2010, pp. 48–57. ^ Abuelsamid, Sam (2007-06-05). "GM awards two battery development contracts for Chevy Volt". AutoblogGreen. ^ a b c d e f Fletcher 2011, pp. 84–89. ^ Wood, Eric; Alexander, Marcus; Bradley, Thomas H. (2011). "Investigation of battery end-of-life conditions for plug-in hybrid electric vehicles" (PDF). Journal of Power Sources. 196 (11): 5147–5154. doi:10.1016/j.jpowsour.2011.02.025. Retrieved 2011-05-22. See p. 5149. ^ Blanco, Sebastian (2016-07-27). "GM will likely build PHEV batteries in China soon". Autoblog. Retrieved 2016-08-18. ^ Blanco, Sebastian (2008-04-03). "GM's Chevy Volt update: All systems go, Malibu-based li-ion mules coming soon". AutoblogGreen. Retrieved 2010-10-23. ^ Kim, Soyoung (2008-10-22). "LG Chem to supply GM Volt batteries". Reuters. Retrieved 2009-08-11. ^ Johnson, Drew (2008-10-24). "GM inks Chevrolet Volt battery contract". Leftlane. Retrieved 2009-08-11. ^ Lawlor, Joe (2009-07-28). "General Motors confirms intention to manufacture engine for battery-powered Volt in Flint". The Flint Journal. Archived from the original on 2009-01-23. ^ Squatriglia, Chuck (2009-04-28). "Billion-Dollar Baby: We Drive the Chevrolet Volt". Wired. Retrieved 2012-02-21. ^ "GM's Response to the GM-Volt.com First Chevy Volt to be Built Post and Comments". GM-VOLT: Chevy Volt Electric Car Site. 2009-03-25. Retrieved 2009-03-29. ^ a b Motavalli, Jim (2009-06-02). "G.M. Says Chevy Volt Is Still on Track". The New York Times. The New York Times Company. Wheels. Retrieved 2009-06-02. ^ a b c Vlasic, Bill; Bunkley, Nick (August 11, 2009). "G.M. Puts Electric Car's City Mileage in Triple Digits". The New York Times. Retrieved 2009-08-11. ^ "GM builds first Chevy Volt, says production line practice run OK". USA Today. 2010-03-31. Retrieved 2010-04-05. ^ "First Pre-Production Chevy Volt Rolls Off Line". Green Car Congress. 2010-04-02. Retrieved 2010-04-05. ^ Chapman, Mary M. (2012-08-14). "Fisker Appoints Tony Posawatz, a Chief With Complementary Roots". The New York Times. The New York Times Company. Wheels. Retrieved 2012-12-28. ^ "Anthony L. Posawatz, P. E." (PDF). World Electric Vehicle Association. Archived from the original (PDF) on 2013-05-09. Retrieved 2014-01-06. ^ a b Vlasic, Bill (2010-11-30). "G.M. to Hire 1,000 to Engineer More Electric Cars". The New York Times. Retrieved 2010-11-30. ^ "Rick Hendrick Wins First Retail Chevy Volt for $225,000". Autoblog. AOL. 2010-12-17. Retrieved 2010-12-17. ^ Jeff Cobb (2014-12-10). "Retrospective: Four Years of Nissan Leaf and Chevy Volt". HybridCars.com. Retrieved 2014-12-10. ^ a b The Canadian Press (2011-09-01). "Chevy brings electric Volt to Canada". CBC News. Retrieved 2011-09-22. ^ a b c William Diem (2011-12-01). "U.S. Embassy in France Buys Four Chevy Volts". The New York Times. Retrieved 2011-12-12. ^ a b c Opel Media (2012-02-21). "Opel Ampera: First Customers Take Delivery". Opel Europe. Retrieved 2012-03-01. ^ a b David Ellery (2012-12-13). "Ambassador gets a charge out of new Volt". The Canberra Times. Retrieved 2012-12-16. ^ Eberle, Ulrich; von Helmolt, Rittmar (2010-05-14). "Sustainable transportation based on electric vehicle concepts: a brief overview". Royal Society of Chemistry. Retrieved 2010-06-08. ^ a b c d e f "Volt's Revolutionary Voltec System Delivers Efficiency with Performance". Holden Australia (Press release). Holden Ltd. 2011-12-09. Archived from the original on 2013-10-20. Retrieved 2013-10-20. ^ General Motors 2012, pp. 9–53. ^ "Why the Volt Requires Premium Gasoline". GM-Volt. 2010-07-30. Retrieved 2011-06-05. ^ Mike Magrath (2010-07-29). "2011 Chevy Volt : Fill 'er Up. With Premium". Edmunds.com. Retrieved 2011-06-05. ^ Abuelsamid, Sam (2010-09-13). "New Problem, New Solution: Chevrolet Volt's "Maintenance Mode" Will Burn Gas To Prevent Aging". AutoblogGreen. AOL. Retrieved 2010-09-13. ^ a b "Chevrolet Volt: Engineered for Everyday Life". General Motors. 2010-10-11. Retrieved 2011-12-16. Download the document Drive_unit.doc on the link Voltec Electric Drive System Overview. ^ Fletcher, Pamela (2010-10-18). "Chevy Volt Powertrain Deep Dive | Part 2". youtube. Retrieved 2013-03-12. ^ "2011 Chevrolet Volt Specifications". General Motors. Archived from the original on 2010-10-18. Retrieved 2011-12-16. Download the document Chevrolet Volt Specifications.doc[permanent dead link] on the link of the same name. ^ a b c "Chevy Volt Delivers Novel Two-Motor, Four-Mode Extended Range Electric Drive System; Seamless Driver Experience Plus Efficiency". Green Car Congress. 2010-10-20. Retrieved 2010-10-21. ^ "900 Miles Reliability Report in the Chevy Volt". Popular Mechanics. 2010-10-10. Retrieved 2010-10-11. ^ a b c d e "Opel to introduce production version of Opel Ampera in Geneva". Green Car Congress. 2011-02-17. Retrieved 2011-02-17. ^ a b c Antony Ingram (2011-03-04). "Chevrolet Volt and Opel Ampera: What Are The Differences?". AllCarsElectric.com. Retrieved 2011-05-20. ^ "Cooling Fins Help Keep Chevrolet Volt Battery at Ideal Temperature". GM Volt Media Portal (Press release). US: General Motors. 2011-02-14. Retrieved 2011-04-28. ^ a b "GM tweaks battery materials, pack size, SOC window to increase 2013 Chevrolet Volt EV range to 38 miles". Green Car Congress. 2012-06-07. Retrieved 2012-06-09. ^ "EVAmerica Baseline Performance Testing, 1999 General Motors EV1 with NiMH Batteries" (PDF). US Department of Energy (DOE), Idaho National Laboratory (INL), Advanced Vehicle Testing Activity (AVTA). 2002-07-30. Archived from the original (PDF) on 2004-10-17. Retrieved 2009-10-08. ^ "EVAmerica Baseline Performance Testing, 1997 General Motors EV1 with PbA Batteries" (PDF). US Department of Energy (DOE), Idaho National Laboratory (INL), Advanced Vehicle Testing Activity (AVTA). 2002-08-02. Archived from the original (PDF) on 2004-10-17. Retrieved 2009-10-08. ^ "EV1 – specs". 2001-04-17. Retrieved 2009-10-09. ^ a b c d "Chevrolet Volt Battery Pack Carries Standard Eight-Year, 100,000-Mile Warranty". Green Car Congress. 2010-07-14. Retrieved 2011-05-23. ^ 2014 Chevrolet VOLT Owner Manual (PDF). US: Chevrolet. Archived from the original (PDF) on 2014-01-20. Retrieved 2014-07-29. ^ "The Chevrolet Volt Cooling/Heating Systems Explained". GM-Volt.com. 2010-12-10. Retrieved 2014-07-26. ^ Zeller, Tom, Jr. (2010-07-14). "G.M. to Offer 8-Year Guarantee for New Electric Car's Battery". The New York Times. Retrieved 2010-07-15. ^ LaMonica, Martin (2010-11-08). "GM envisions refreshing EV batteries". CNET News Green Tech. Retrieved 2011-04-28. ^ "GM Applies for Patent for Lithium-ion Battery Cell Refurbishing System". GM-Volt.com. 2010-11-08. Retrieved 2012-05-16. ^ a b c "2011 Chevrolet Volt Road Test Specs". Edmunds.com. Retrieved 2011-06-05. ^ "2011 Chevrolet Volt Receives New Fuel Economy Label From EPA | Volt". Chevroletvoltage.com. 2010-11-24. Retrieved 2011-06-02. ^ Brieter, Klaus (2012). "Ein Auto mit eigenem Kraftwerk". ADAC Motorwelt (in German) (1): 26–30. ^ a b c "2011–12 Chevrolet Volt". Fueleconomy.gov. 2011-11-07. Retrieved 2011-11-07. ^ Hedevang, Kurt (2011-09-28). "Opel Ampera below 600,000 DKK" (in Danish). Consumer Online. Archived from the original on 2011-10-06. Retrieved 2011-10-14. ^ Evarts, Eric (2011-12-08). "Leaf, Volt Tests Show Electric Cars Cost Less per Mile To Operate". Consumer Reports. Archived from the original on 2012-01-08. Retrieved 2011-12-09. ^ Krebs, Michelle (2012-02-28). "Will Higher Gas Prices Boost Hybrid, EV Sales?". Edmunds.com. Retrieved 2012-02-29. ^ "Euro NCAP results for Chevrolet Volt" (PDF). euroncap.com. 2011. ^ Blanco, Sebastien (2011-06-03). "Chevy Volt earns five-star NHTSA crash rating". AutoblogGreen. Retrieved 2011-06-03. ^ "General Motors Kicks Off National Electric Vehicle Training Tour For First Responders". Green Car Congress. 2010-08-27. Retrieved 2011-11-11. ^ Motavalli, Jim (2010-06-01). "Electric Car Warning Sounds: Don't Expect Ring Tones". The New York Times. The New York Times Company. Wheels. Retrieved 2010-06-02. ^ a b Jeff Cobb (2015-11-03). "2016 Volts Account For 1,324 Sales Out Of 2,035 October Deliveries". HybridCars.com. Retrieved 2015-11-03. ^ Klippenstein, Matthew (2015-11-06). "Plug-in Electric Car Sales in Canada, October 2015: The Wallet Ballot". Green Car Reports. Retrieved 2015-11-07. ^ a b c Loveday, Steven (2016-02-28). "2017 Chevrolet Volt Arrives At Dealerships, Deals Announced". InsideEVs.com. Retrieved 2016-02-28. ^ Lindsay Brooke (2014-10-28). "New Volt Will Have Improved Powertrain and Longer Range". The New York Times. Retrieved 2014-11-15. ^ Mark Phelan; Greg Gardner (2014-11-01). "GM CEO: 2016 Volt gets U.S. drivetrain, Detroit debut". USA Today. Retrieved 2014-10-28. ^ a b c U.S. Environmental Protection Agency and U.S. Department of Energy (2015-09-01). "Compare Side-by-Side - 2016/2015 Chevrolet Volt". Fueleconomy.gov. Retrieved 2015-09-02. ^ U.S. Environmental Protection Agency and U.S. Department of Energy (2016-03-18). "Compare Side-by-Side - 2017/2016 Chevrolet Volt". Fueleconomy.gov. Retrieved 2016-03-20. ^ Cole, Jay (2013-04-30). "GM CEO: Chevrolet Volt Price To Drop By $7,000 to $10,000 For Next Gen". InsideEVs.com. Retrieved 2013-05-01. ^ John Voelcker (2015-05-03). "2016 Chevrolet Volt Priced From $33,995, Or $1,175 Lower Than 2015 Volt". Green Car Reports. Retrieved 2015-06-14. ^ Chris Bruce (2015-05-27). "Chevy Volt orders start tomorrow". Autoblog.com. Retrieved 2015-06-14. ^ a b Staff (2014-07-23). "Opel plans 'electric' successor to Ampera plug-in hybrid". Automotive News. Retrieved 2014-07-23. ^ Korosec, Kirsten (2016-02-11). "GM Unveils an All-Electric Car for Europe". Fortune. Retrieved 2016-02-12. ^ Bruce, Chris (2016-02-12). "Opel Ampera-e brings a Bolt of EV driving to Europe". Autoblog.com. Retrieved 2016-02-12. ^ a b Mike Costello (2015-04-25). "The Holden Volt is dead". Car Advice. Retrieved 2015-04-26. ^ a b c "2011 Chevrolet Volt". Fueleconomy.gov. 2011-05-04. Retrieved 2011-05-08. ^ "How Vehicles Are Tested". fueleconomy.gov web site. US EPA. Retrieved February 2, 2012. ^ "Many Factors Affect MPG". fueleconomy.gov web site. US EPA. Retrieved February 2, 2012. ^ a b c d e f "Chevrolet Volt MSRP Starts at $41,000, $33,500 Net of Full Federal Credit; 3-year Lease Program with Option to Buy". Green Car Congress. 2010-07-27. Retrieved 2010-07-27. ^ a b c d "Chevrolet begins taking orders in all 50 US states for 2012 Volt; $1K drop in starting price". Green Car Congress. 2011-06-10. Retrieved 2011-06-10. ^ a b Nikki Gordon-Bloomfield (2013-06-08). "2014 Volt Drops Price By $5,000 to $34,995". Plugincars.com. Retrieved 2013-08-06. ^ a b c d "Chevrolet Canada begins taking orders for the Volt starting at C$41,545; Volts a showroom draw in US". Green Car Congress. 2011-05-04. Retrieved 2011-05-05. ^ a b Crowe, Phillipe (2013-08-14). "Chevy Volt Price Reduction Confirmed For Canada; Also $5,000". HybridCars.com. Retrieved 2013-08-14. ^ a b Aaron Richardson (2011-03-07). "Chevrolet Volt priced from €41,950 in Europe". Autoblog.com. Retrieved 2011-12-31. ^ a b Luke Johnson (2012-05-02). "Vauxhall Ampera electric car UK release date and price". T3. Retrieved 2012-05-02. ^ a b Eric Loveday (2011-07-06). "2012 Chevrolet Volt priced from £28,545 in UK". AutoblogGreen. Retrieved 2011-07-06. ^ Wang Xin (2011-11-21). "雪佛兰沃蓝达电动车车展上市 售49.8万元 (Chevrolet Volt launched on auto show, retails for CNY498,000)". Sohu.com. Retrieved 2016-05-06. ^ a b Mike Stevens (2012-07-02). "Holden Volt Pricing And Specifications Announced For Australia". The Motor Report. Retrieved 2012-07-03. ^ a b Jacqui Madelin (2012-11-18). "Holden: Charged up performer". The New Zealand Herald. Retrieved 2012-12-16. ^ Terlep, Sharon; Aguilar, Louis (2007-09-29). "Detroit to build GM's car of future". Detroit News. ^ Fonger, Ron (2009-01-13). "Chevy Volt's first range-extending engines will come from Austria, not Flint". MLive. MLive Media Group. Retrieved 2009-01-15. ^ "GM to Invest $163 Million, Retain 184 Jobs in Three Plants". GM News. 2010-11-24. Archived from the original on 2010-11-27. Retrieved 2011-05-19. ^ "GM investing $109M in Mich plants to support 1.4L Ecotec engines". Green Car Congress. 2011-05-13. Retrieved 2011-05-19. ^ "Chevrolet Increases Projected 2012 Volt Production Capacity by 50 Percent". Car and Driver. 2010-07-30. Retrieved 2010-08-03. ^ a b Jolley, David (2011-08-04). "Opel/Vauxhall to receive 10,000 Amperas from GM next year". Automotive NewsEurope. Retrieved 2011-08-09. ^ a b c Bunkley, Nick (2012-03-02). "G.M. Again Pauses Production of Chevy Volt". The New York Times. Retrieved 2012-03-07. ^ a b Popely, Rick (2012-03-02). "Will the Chevy Volt be sold in Mexico?". Chicago Tribune. Archived from the original on 2012-03-06. Retrieved 2012-03-07. ^ "GM Chooses LG Chem to Supply Chevy Volt's Lithium-ion Batteries and Will Build the Packs Themselves". GM-Volt.com. January 12, 2009. ^ "LG Chem Wins GM Supplier of the Year Award". Electric Cars Report. 2011-03-17. Retrieved 2011-05-19. ^ "LG Chem to establish new electrolyte production plant in Michigan". Green Car Congress. 2010-11-07. Retrieved 2011-05-19. ^ "First Chevy Volts Reach Customers, Will Out-Deliver Nissan in December". plugincars.com. 2010-12-16. Retrieved 2010-12-17. ^ a b c Sebastian Blanco (2012-01-05). "Chevy Volt will receive safety enhancements, but don't call it a recall". AutoblogGreen. Retrieved 2012-01-05. See GM Press Release. ^ a b c Voelcker, John (2012-01-05). "Chevrolet To Offer Volt Modifications Against Battery Fire Risk". Green Car Reports. Retrieved 2012-01-05. ^ Shepardson, David (2011-07-19). "GM Restarts Volt Production". The Detroit News. Retrieved 2011-05-31. ^ "Volt drawing strangers to Chevy into dealerships". AutoblogGreen. 2011-08-30. Retrieved 2011-09-08. ^ Higgins, Tim (2012-04-04). "GM CEO Seeks to Boost Volt's Monthly Sales to 3,000". Bloomberg Markets. Retrieved 2012-04-14. ^ Stevens, Matt (2012-03-03). "GM to pause Chevy Volt production for 5 weeks". Los Angeles Times. Retrieved 2012-03-07. ^ "Chevy Volt sales double in March". Fox News. 2012-04-03. Archived from the original on 2012-04-06. Retrieved 2012-04-03. ^ Healey, James (2012-08-27). "GM suspending Chevy Volt output, retooling for Impala". USA Today. Retrieved 2012-08-28. ^ Cobb, Jeff (2012-07-24). "2013 Chevy Volts Now Available". HybridCars.com. Retrieved 2012-07-31. ^ "Cadillac extended range electric vehicle ELR to be built at Detroit-Hamtramck". Green Car Congress. 2012-10-16. Retrieved 2012-10-17. ^ a b Jeffrey N. Ross (2013-09-11). "First Cadillac ELR rolls off the line". Autoblog.com. Retrieved 2013-05-30. ^ Cole, Jay (2013-08-09). "2014 Chevrolet Volt Shipping Now". InsideEvs.com. Retrieved 2013-08-11. ^ Jeff Cobb (2013-11-01). "GM Sells 50,000th Chevy Volt In October". HybridCars.com. Retrieved 2013-11-02. ^ Eric Loveday (2013-11-02). "Chevy Volt Sales Surpass 50,000 in US". InsideEVs.com. Retrieved 2013-11-02. ^ Jeffrey N. Ross (2015-05-21). "Last First-Gen Chevy Volt Rolls Off The Assembly Line". TopSpeed.com. Retrieved 2015-06-14. ^ Eric Loveday (2015-03-30). "Pre-Production 2016 Chevrolet Volts Now Being Built – Pricing Announcement Expected Next Month". InsideEVs.com. Retrieved 2015-03-31. ^ a b c Cobb, Jeff (2016-07-26). "Top-Selling Chevy Volt Crosses 100,000 US Sales Milestone". HybridCars.com. Retrieved 2016-07-26. As of June 2016[update], around 117,000 units of the Volt/Ampera family have been sold globally, including close to 10,000 Opel/Vauxhall Ampera variants sold in Europe. Volt sales in the American market passed the 100,000 milestone in July 2016. ^ a b Cobb, Jeff (2016-08-01). "100,000th Chevy Volt Sold in US". HybridCars.com. Retrieved 2016-08-09. ^ Valdes-Dapena, Peter (2010-07-01). "Chevy Volt bound for Texas, New York area". CNN Money. Retrieved 2010-07-01. ^ Motavilli, Chris (2010-07-01). "Chevy Volt's Initial Rollout to Include New York City". The New York Times. The New York Times Company. Wheels. Retrieved 2010-07-01. ^ a b "Chevrolet Volt Plant Prepping for Boost in Volt and Ampera Production; Exports to Canada, China and Europe This Year". Green Car Congress. 2011-05-19. Retrieved 2011-05-19. ^ a b c Loveday, Eric (2011-06-10). "2012 Chevrolet Volt Priced at $39,995*, Now Available To Order Ntionwide". AutoblogGreen. AOL. Retrieved 2011-06-10. ^ "2011 Volt". General Motors Company. Retrieved 2011-01-01. ^ "Purchasers of Plug-In Cars Will Get Tax Credits". NBCnews.com. Associated Press. 2008-10-30. Retrieved 2009-07-25. Plug-in electric cars with at least a 4-kilowatt-hour battery pack will be eligible for a US$2,500 credit, with an additional US$417 for each additional kilowatt-hour of battery capacity, up to US$7,500. The Volt is eligible for the maximum credit. ^ "Notice 2009–89: New Qualified Plug-in Electric Drive Motor Vehicle Credit". Internal Revenue Service. 2009-11-30. Retrieved 2010-04-01. ^ "State and Federal Incentives for EVs, PHEVs and Charge Stations". Plug In America. Retrieved 2010-05-29. ^ Motavalli, Jim (2010-07-28). "The $41,000 Question: Is the Chevy Volt Worth the Money?". The New York Times. The New York Times Company. Wheels. Retrieved 2010-07-31. ^ Cohen, Ariel (2018-11-30). "GM Must Adapt Or Die: A Lesson For U.S. Automakers". Forbes. Retrieved 2018-12-01. ^ Evarts, Eric (2010-10-06). "Pricing: Chevrolet Volt home charger to cost $490 to $2,000". Consumer Reports. Retrieved 2014-01-06. ^ "GM Prices Volt Home Charger, Installation; Names National Installer". Edmunds.com. 2010-10-07. Archived from the original on 2010-10-10. Retrieved 2010-10-11. ^ "Clean Vehicle Rebate Project General CVRP Questions: Why does the Chevrolet Volt NOT qualify this year?". Center for Sustainable Energy California. Archived from the original on 2011-10-15. Retrieved 2011-05-22. ^ Motavalli, Jim (2011-09-20). "Banished from the H.O.V. Lane, Prius Drivers May Be First to Embrace New Plug-In Model". The New York Times. The New York Times Company. Wheels. Retrieved 2011-09-25. ^ a b King, Danny (2012-02-24). "GM starts deliveries of 2012 HOV-lane-eligible Chevy Volts in California". AutoblogGreen. Retrieved 2012-02-27. ^ "2012 Volt Moves Into California's HOV Fast Lane". AutoblogGreen. 2011-11-16. Retrieved 2011-11-17. See details in GM Press Release. ^ "Chevy Volt gets a Low Emissions Package for California; HOV lanes access". Green Car Congress. 2011-11-17. Retrieved 2011-11-17. ^ Nikki Gordon-Bloomfield (2012-01-19). "Can Your 2012 Chevy Volt Use California HOV Lanes? It Depends". Green Car Reports. Retrieved 2012-01-20. ^ "Clean Special Fuel Vehicles/Plates". Virginia Department of Motor Vehicles. Retrieved 2013-04-02. ^ a b c Kane, Mark (2019-01-25). "Top 3 Plug-In Hybrid Cars In U.S. In 2018: Prius Prime, Clarity, Volt". InsideEVs.com. Retrieved 2019-01-25. The Chevrolet Volt is the best selling plug-in electric car in the U.S. with 152,144 units sold through the end of 2018. ^ Jay Cole (2015-04-01). "Nissan LEAF Sales Strengthen In March, Takes All-Time US Plug-In Sales Lead". InsideEVs.com. Retrieved 2015-04-02. ^ Blanco, Sebastian (2016-04-04). "Chevy Volt reclaims US plug-in sales crown from Nissan Leaf". Autoblog.com. Retrieved 2016-04-06. "As of March 2016[update], the Chevrolet Volt is the all-time selling plug-in car in the U.S. with 92,737 units, while the Nissan Leaf ranks second with 92,522 units sold, both, since December 2010." ^ Kane, Mark (2019-03-12). "US Plug-In Electric Car Sales Charted: February 2019". InsideEVs.com. Retrieved 2019-03-13. ^ Automotive News (2011-05-17). "KBB sets Chevy Volt resale value at $17,000 after 36 months". AutoblogGreen. Retrieved 2011-05-21. ^ a b "Chevrolet Volt resale value after three years? $17,000". Consumer Reports. 2011-05-18. Retrieved 2011-05-21. ^ a b "2012 Best Resale Value Awards: Electric Car - Best Electric Car: 2012 Chevrolet Volt". Kelley Blue Book. 2011-11-16. Archived from the original on 2011-11-19. Retrieved 2011-11-17. ^ Cheryl Jensen (2011-11-16). "Toyota and Lexus Are Back on Top in Kelley Blue Book Resale Value Survey". The New York Times. Retrieved 2011-11-17. ^ David Biello (2013-06-18). "Will You or the Grid Control Your Electric Car?". Scientific American. Retrieved 2013-06-23. ^ "Chevrolet Volt Canadian Launch Markets Revealed". General Motors Media. 2010-12-02. Archived from the original on 2010-12-08. Retrieved 2010-12-07. ^ Wanda Chow (2011-09-19). "Eager customer takes delivery of Chevy Volt in Burnaby". Burnaby NewsLeader News. Archived from the original on 2011-09-23. Retrieved 2011-09-22. ^ Matthew Klippenstein (2014-01-15). "Plug-In Electric Car Sales In Canada In 2013: Up 50 Percent". Green Car Reports. Retrieved 2014-01-23. ^ Matthew Klippenstein (2015-01-15). "Plug-In Electric Car Sales For Canada In 2014: Steady Growth". Green Car Reports. Retrieved 2015-06-14. ^ a b c d e Cain, Timothy (October 2018). "Chevrolet Volt Sales Figures". Good Car Bad Car. Retrieved 2018-12-01. ^ Garry Marr (2010-11-17). "We'll go green if the price is right". Ottawa Citizen. Retrieved 2011-06-02. ^ "Ontario Paves The Way For Electric Vehicles". Newsroom Ontario. 2010-06-18. Retrieved 2010-06-21. ^ Tim Pollard (2010-12-13). "Chevrolet Volt for European sale in November 2011". Car Magazine Online. Retrieved 2010-05-20. ^ "European Volt makes official debut as the new Opel Ampera". Motor Authority. 2009-03-02. Retrieved 2010-07-02. ^ "The Ultimate Posting on Plug-In Hybrid Developments: Clip & Save". Calcars.org. Retrieved 2009-10-13. ^ "AUTOStraßenverkehr". Autostrassenverkehr.de. Archived from the original on 2009-04-02. Retrieved 2009-08-19. ^ "Is the Ampera any more than a Volt with a nose job?". GreenMotor.co.uk. 2011-04-17. Retrieved 2011-05-21. ^ Sebastian Blanco (2011-05-20). "Bibendum 2011: Opel Ampera not only looks better than the Chevy Volt, it can do more, too". AutoblogGreen. Retrieved 2011-05-21. ^ Opel (2011-07-08). "Report: Is the 2011 Opel Ampera sold out?". AutoblogGreen. Retrieved 2011-07-10. See Opel press release. ^ "Opel has received more than 7,000 orders for Volt cousin Ampera". Green Car Congress. 2012-03-05. Retrieved 2012-04-21. ^ "Vauxhall Ampera offered through Zipcar car sharing scheme". Green Car Congress. 2012-05-20. Retrieved 2012-05-21. ^ a b c d Mat Gasnier (2013-02-10). "Europe Full Year 2012: Now with Top 350 models & Top 60 brands". Best Selling Cars Blog. Retrieved 2013-02-13. Ampera sales in Europe totaled 5,268 units in 2012 and 304 in 2011. ^ a b Christopher Bruce (2012-12-12). "Europe's Best Selling Electric Car Is the Opel/Vauxhall Ampera". Autovia. Retrieved 2013-02-13. ^ Jose Pontes (2013-11-23). "Europe October 2013". EV Sales. Retrieved 2013-11-23. ^ a b c d e Mike Colias (2014-07-21). "Opel will discontinue weak-selling Ampera, sources say". Automotive News Europe. Retrieved 2014-07-23. Ampera sales in Europe totaled 3,184 units in 2013. ^ Mitsubishi News Release (2014-01-20). "Mitsubishi Outlander PHEV CY13 sales – European inauguration". Automotive News. Retrieved 2014-07-24. A total of 8,197 Mitsubishi Outlander P-HEVs were sold in Europe in 2013. ^ EV Sales (2014-01-26). "Europe December 2013". Retrieved 2014-07-24. A total of 7,437 Volvo V60 PHEVs and 4,314 Prius PHEVs were sold in Europe in 2013. ^ a b Cobb, Jeff (2016-08-10). "Global 10 Best-Selling Plug-In Cars Are Accelerating Forward". HybridCars.com. Retrieved 2016-08-13. As of June 2016[update], cumulative global sales of the top selling plug-in electric cars were led by the Nissan Leaf (over 228,000), followed by the Tesla Model S (129,393), Votl/Ampera family (about 117,300), Mitsubishi Outlander PHEV (about 107,400), Toyota Prius PHV (over 75,400), BYD Qin (56,191), Renault Zoe (51,193), BMW i3 (around 49,500), Mitsubishi i-MiEV family (about 37,600) and BYD Tang (37,509). ^ Staff (2016-02-11). "Opel bringt 2017 neues Elektroauto" [Opel brings new electric car in 2017]. Autohaus.de (in German). Retrieved 2016-03-31. About 10,000 Opel Amperas were sold in Europe by the end of 2015. ^ a b c d e f RAI (January 2016). "Nieuwverkoop Personenautos Per Merk/Model - 2015/12 2015 totaal" [New passenger cars sales by brand/model 2015/12 2015 total] (in Dutch). RAI Vereniging. Archived from the original on 2016-03-06. Retrieved 2016-03-13. ^ a b c d e f RAI (January 2015). "Verkoopstatistieken" [Sales Statistics] (PDF) (in Dutch). RAI Vereniging. Archived from the original (PDF) on 2015-07-09. Retrieved 2016-03-13. Download the pdf file for detailed sales by model during 2014: "nieuwverkoop personenautos 201412 Archived 2015-02-01 at the Wayback Machine". ^ a b c d e f "Verkoopcijfers stekkerauto's 2013: de eindsprint" [Plug-in car sales in 2013: the final sprint] (in Dutch). Groen7. 2014-01-07. Retrieved 2016-03-13. The table shows sales by models for 2011, 2012 and 2013. ^ a b c d Kraftfahrt-Bundesamtes (KBA). "Neuzulassungen von Personenkraftwagen im Dezember 2011 nach Segmenten und Modellreihen" [New registrations of passenger cars in December 2011 by segment and model lines] (PDF). KBA (in German). Retrieved 2012-10-15. A total of 241 Amperas and 25 Volts were sold through December 2011. ^ a b c d Kraftfahrt-Bundesamtes (KBA) (January 2013). "Neuzulassungen von Personenkraftwagen im Dezember 2012 nach Marken und Modellreihen" [New registrations of passenger cars in December 2012 by make and model series] (PDF). KBA (in German). Retrieved 2013-01-14. ^ a b c d Kraftfahrt-Bundesamtes (KBA) (January 2014). "Neuzulassungen von Personenkraftwagen im Dezember 2013 nach Segmenten und Modellreihen" [New registrations of passenger cars in December 2013 by segment and model series] (PDF) (in German). KBA. Retrieved 2014-01-23. ^ a b c d Kraftfahrt-Bundesamtes (KBA) (January 2015). "Neuzulassungen von Personenkraftwagen nach Segmenten und Modellreihen im Dezember 2014" [New registrations of passenger cars in December 2014 by segment and model] (PDF) (in German). KBA. Archived from the original (PDF) on 2015-04-17. Retrieved 2015-02-08. A total of 117 Amperas and zero Volts were registered in Germany in 2015. ^ a b c d Kraftfahrt-Bundesamt (KBA) (January 2016). "Neuzulassungen von Personenkraftwagen nach Segmenten und Modellreihen im Dezember 2015" [New registrations of passenger cars by segments and models in December 2015] (PDF) (in German). KBA. Archived from the original (PDF) on 2016-01-25. Retrieved 2016-03-31. 21 Amperas and zero Volts were registered in Germany in 2015. ^ a b c Jeff Cobb (2015-11-04). "GM Sells Its 100,000th Volt in October". HybridCars.com. Retrieved 2015-11-04. About 102,000 units of the Volt/Ampera family have been sold worldwide by the end of October 2015. ^ "Production Version of Opel Ampera: World Premiere in Geneva". Opel Media (press release). 2011-02-17. Archived from the original on 2011-02-26. Retrieved 2011-07-10. ^ "Growing Number of EU Countries Levying CO2 Taxes on Cars and Incentivizing Plug-ins". Green Car Congress. 2010-04-21. Retrieved 2010-04-23. ^ "An Increasing Number of Member States Levy CO2-Based Taxation or Incentivise Electric Vehicles". European Automobile Manufacturers Association. 2010-04-21. Retrieved 2010-04-23. ^ Adam Vaughan (2012-05-01). "Vauxhall predicts Ampera will boost electric car sales". The Guardian. Retrieved 2012-05-02. ^ "Chevrolet Volt lands in China, sales to begin next year". China Car Times. 2010-09-01. Retrieved 2012-08-14. ^ "General Motors Celebrates Arrival of Chevrolet Volt in China". General Motors News Release. 2010-08-31. Retrieved 2010-09-01. ^ Ray Jing (2012-01-05). "Chevy Volt enters China for demonstration". China Automotive Review. Retrieved 2012-01-23. ^ Ray Jing (2012-01-11). "Volt will be a hot seller in China, but not now". China Automotive Review. Retrieved 2012-01-23. ^ Keith Bradsher (2011-09-05). "Hybrid in a Trade Squeeze". The New York Times. Retrieved 2011-09-08. ^ Ben Klayman (2012-08-10). "GM plans alternative-energy push in China despite slow Volt launch". Automotive News. Retrieved 2012-08-14. ^ Mike Colias (2012-08-16). "Volt sales target is red meat for the bashers". Automotive News. Retrieved 2012-08-18. ^ "GM China signs MOU with CATARC for Chevrolet Volt demo fleet". Green Car Congress. 2012-03-26. Retrieved 2012-03-26. ^ Ogbac, Stefan (2017-04-18). "Extended range plug-in hybrid to be manufactured in China". Motortrend. US. Retrieved 2018-12-02. ^ Martin Tesar (2012-12-08). "First Holden Volt Now Delivered In Australia; An Owner's Story". Inside EVs. Retrieved 2012-12-16. ^ "Holden Volt Reinvents Automotive Transportation". Holden Media Australia. 2011-12-09. Retrieved 2011-12-15. ^ "Holden Volt Hits Australia For Tests, Launch Set For Late 2012". The Motor Report. 2011-11-15. Retrieved 2011-11-15. ^ "Only 49 dealers to sell Holden's Volt". The Australian. 2012-06-11. Retrieved 2012-06-23. ^ a b Mat Gasnier (2013-01-05). "Australia Full Year 2012: Mazda3 leads again in record market, no local model on podium for the first time since 1930s!". Best Selling Car Blog. Retrieved 2013-01-18. ^ a b Mat Gasnier (2014-01-16). "Australia Q4 2013: Jeep Grand Cherokee shines". Best Selling Cars Blog. Retrieved 2014-01-25. ^ "GM vai trazer Volt para o Brasil para fazer testes". O Estado de S. Paulo (in Portuguese). 2011-01-10. Archived from the original on 2012-07-31. Retrieved 2011-01-17. ^ "Carro híbrido Volt da GM deveria incluir tecnologia flex". UNICA, Brazil (in Portuguese). 2011-01-14. Archived from the original on 2012-07-19. Retrieved 2011-01-17. ^ "GM Announces Chevy Volt Canadian Rollout Plans and Asian Exports". GM-Volt.com. 2010-12-05. Retrieved 2010-12-07. ^ Luft, Alex (2019-02-10). "Chevy Volt Sales Increase 1 Percent To 5,063 Units In Q4 2018". GM Authority. Retrieved 2019-02-17. ^ "Holden's Volt dealers all fired up". The New Zealand Herald. 2012-06-16. Retrieved 2012-06-23. ^ Dobson, Liz (2015-07-05). "Holden Volt unplugged". Driven. Retrieved 2019-02-17. ^ Mat Gasnier; Austin Rutherford (2013-03-20). "World Full Year 2012: Discover the Top 1000 best-selling models!". Best Selling Cars Blog. Retrieved 2013-03-28. ^ Cobb, Jeff (2017-01-09). "Nissan's Quarter-Millionth Leaf Means It's The Best-Selling Plug-in Car In History". HybridCars.com. Retrieved 2017-01-10. As of December 2016[update], the Nissan Leaf is the world's best-selling plug-in car in history with more than 250,000 units delivered, followed by the Tesla Model S with over 158,000 sales, the Volt/Ampera family of vehicles with 134,500 vehicles sold, and the Mitsubishi Outlander PHEV with about 116,500 units sold through November 2016. These are the only plug-in electric cars so far with over 100,000 global sales. ^ a b Nick Gibbs (2015-04-24). "Plug-ins poised to be Europe's top electrified drivetrain". Automotive News Europe. Retrieved 2016-03-30. A total of 5,441 Volvo V60 PHEVs and 933 Opel Amperas were sold in Europe in 2014. ^ a b c RAC Foundation. "Plug-in grant eligible vehicles licensed". UK: RAC Foundation. Retrieved 2016-01-22. Figures correspond to the number of vehicles registered at the end of the corresponding month. A total of 1,279 Amperas were registered in the UK at the end of September 2015, and 125 Volts at the end of June 2015. The number of registered Volts decreased by September 2015. ^ "December 2010 Dashboard: Year End Tally". HybridCars.com. 2011-01-07. Retrieved 2011-02-02. ^ "GM's U.S. Sales up 5 percent in December". General Motors Media. 2013-01-03. Retrieved 2013-01-03. Click on the link Downloads: Deliveries-December-2012.pdf - See GM U.S. Deliveries for December 2012: 7,671 units in 2011 and 23,461 in 2012. ^ Jeff Cobb (2014-01-06). "December 2013 Dashboard". HybridCars.com and Baum & Associates. Retrieved 2014-01-23. ^ Jeff Cobb (2015-01-06). "December 2014 Dashboard". HybridCars.com and Baum & Associates. Retrieved 2015-01-10. A total of 18,805 Volts were sold in 2014. See section "December 2014 Plug-in Hybrid Car Sales Numbers"
^ Cobb, Jeff (2016-01-06). "December 2015 Dashboard". HybridCars.com and Baum & Associates. Retrieved 2016-03-31. A total of 15,393 Volts were sold in 2015. See section "December 2015 Plug-in Hybrid Car Sales Numbers"
^ Pontes, Jose (2015-01-15). "Australia Full Year 2014 (Updated)". EV Sales. Retrieved 2015-02-08. ^ Pontes, Jose (2015-10-16). "Australia September 2015". EV Sales. Retrieved 2016-04-07. ^ a b Vereinigung Schweizer Automobil-Importeure. "Autoverkäufe nach Modellen - Modellstatistik" [Passenger cars by model - Statistics by model] (in German). Auto Schweiz Suisse. Retrieved 2016-03-31. Under "Modellstatistiken 2010–2015" click "2015 Statistik" to download the file "ModellePW2015" with sales by model for 2015; "2014 Statistik" to download the file "ModellePW2014" with sales by model for 2014; "2013 Statistik" to download the file "ModellePW2013" with sales by model for 2013; and click the tabs "2012 Statistik" and "2011 Statistik" to download the files with 2012 and 2011 sales by model. ^ a b "UK First Quarter 2012: Now with Top 316 models Ranking!". Best Selling Car Blog. 2012-05-01. Retrieved 2012-05-05. A total of 4 Amperas were sold in 2011. ^ a b Mat Gasnier (2013-02-01). "UK Full Year 2012: Now with Top 350 All-models ranking!". Best Selling Cars Blog. Retrieved 2013-02-07. A total of 455 Amperas and 67 Volts were sold in 2012. ^ a b Mat Gasnier (2013-05-07). "UK January-March 2013: Discover the Top 328 best-sellers!". Best Selling Cars Blog. Retrieved 2013-05-19. ^ a b Jay Nagley (2013-09-16). "Price cut to jolt Vauxhall Ampera sales". Autocar. Retrieved 2013-10-02. 150 Amperas and 23 Volts were sold during the first half of 2013. ^ a b Michaël Torregrossa (2013-01-15). "Voitures hybrides – Le bilan des immatriculations 2012 en France" [Hybrid Cars - The balance of 2012 registrations in France]. Association pour l'Avenir du Véhicule Electrique Méditerranéen (AVEM) (in French). Retrieved 2013-01-15. ^ a b Michaël Torregrossa (2014-01-19). "Hybride rechargeable – Le marché français stagne en 2013" [Rechargeable hybrids - The French market stagnated in 2013] (in French). Association pour l'Avenir du Véhicule Electrique Méditerranéen (AVEM). Retrieved 2014-01-25. ^ Jose Pontes (2015-01-17). "France December 2014". EVSales.com. Retrieved 2015-02-09. ^ a b Jose Pontes (2016-01-11). "France December 2015". EVSales.com. Retrieved 2016-04-07. ^ a b "Belgium November 2012: Discover the Top 338 All-models ranking". Best Selling Car Blog. 2012-12-04. Retrieved 2012-12-07. ^ a b Jose Pontes (2014-01-18). "Belgium December 2013". EV Sales. Retrieved 2014-01-25. ^ a b Pontes, Jose (2015-01-24). "Belgium December 2014". EV Sales. Retrieved 2015-02-10. ^ a b Pontes, Jose (2016-01-26). "Belgium December 2015". EV Sales. Retrieved 2016-04-09. ^ a b "2012 (Full Year) Sweden: Best-Selling Electric Cars & Plug-In Hybrid Models". BestSellingCars.com. 2013-04-02. Retrieved 2013-07-05. 88 Amperas and 33 Volts were sold in 2012. ^ a b Bil Sweden (2014-01-02). "Nyregistreringar december 2013 prel" [New registrations in December 2013 prel] (in Swedish). Bil Sweden. Retrieved 2014-01-25. Download file "Nyregistreringar december 2013 prel.pdf" see table "NYREGISTRERADE SUPERMILJÖBILAR DECEMBER 2013" with summary of PEV sales by model for 2013 and 2012. ^ a b Bil Sweden (2015-01-02). "Nyregistreringar december 2014 (prel)" [New registrations in December 2014 (preliminar)] (in Swedish). Bil Sweden. Retrieved 2015-02-10. Download file "Nyregistreringar december 2014 (prel)" see table "Nyregistrerade supermiljöbilar december 2014" with summary of plug-in passenger car registrations by model for 2013 (revised) and 2014 sales. ^ Jose Pontes (2014-07-14). "France June 2014". EVSales.com. Retrieved 2014-08-05. ^ "Over 10.000 ladbare biler på norske veier" [Over 10,000 plug-in cars in Norwegian roads]. Grønn bil (in Norwegian). 2013-01-04. Archived from the original on 2013-04-29. Retrieved 2013-07-05. ^ Staff (2014-01-08). "Over 20.000 ladbare biler på norske veier" [Over 20,000 rechargeable electric cars on Norwegian road] (in Norwegian). Grønn bil. Archived from the original on 2014-01-23. Retrieved 2014-01-25. A total of 94 Amperas were registered in 2013, of which 88 were new cars and 6 were used imports form neighboring countries. One used Volt was also registered. ^ Norwegian Road Federation (OFV) (January 2015). "CO2-utslippet i desember 2014" [CO2 emissions in December 2014] (in Norwegian). OFV. Retrieved 2015-02-14. See graph: Gjennomsnittlig CO2-utslipp for registrerte ney personbiler per modell 2014, til og med desember. A total of 18 Amperas were registered in Norway in 2014. ^ Jose Pontes (2015-01-09). "Norway December 2015". EVSales.com. Retrieved 2016-03-07. ^ KFZ- Wirtschaftsverlag (2014-01-01). "Aktuelle Zulassungsstatistik" [current registration statistics] (in German). Automotive.co.at. Retrieved 2014-01-23. See data for "Jän - Dez 2013" and "Jän - Dez 2012"
^ a b Jose Pontes (2015-01-24). "Austria December 2014". EVSales.com. Retrieved 2015-02-14. ^ Pontes, Jose (2015-01-26). "Austria December 2015". EVSales.com. Retrieved 2015-04-09. ^ Rory Jurnecka (2010-01-11). "GM Will Produce Volt-Based Cadillac Converj Plug-in Concept". Motor Trend. Retrieved 2011-05-23. ^ "Cadillac Converj extended range EV concept officially headed for production". Green Car Congress. 2011-08-17. Retrieved 2011-08-17. ^ Burden, Melissa (2013-10-11). "GM Prices Cadillac ELR Plug-In Coupe at $75,995". The Detroit News. Archived from the original on 2013-10-11. Retrieved 2013-10-13. ^ Jay Cole (2014-01-03). "Cadillac ELR Arrives Early, Manages To Sell 6 Copies In December". InsideEvs.com. Retrieved 2014-01-03. ^ Sam Abuelsamid (2010-04-22). "Beijing 2010: Chevrolet Volt MPV5 crossover revealed". AutoblogGreen. Retrieved 2010-07-02. 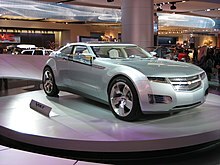 ^ "GM Unveils Chevrolet Volt MPV5 Electric Concept at Auto China 2010". General Motors Media. 2010-04-22. Archived from the original on 2010-04-25. ^ Stephen Williams (2013-09-10). "Frankfurt Motor Show: The Opel Monza Returns". The New York Times. Retrieved 2013-09-11. ^ Jeffrey N. Ross (2013-09-10). "Opel Monza Concept soars into Frankfurt [w/video]". Autoblog.com. Retrieved 2013-09-11. ^ "Chevy Volt – 100 mpg, or 48 mpg?". U.S. News, Rankings and Reviews. 2008-09-08. ^ "Could the EPA cripple the Chevy Volt?". Motor Trend. 2008-09-05. ^ a b Bailey, David; Krolicki, Kevin (2010-11-24). "Chevy Volt Tops Prius in Fuel Economy Rating". Reuters. Retrieved 2010-11-24. ^ "EPA, DOT unveil the next generation of fuel economy labels". Green Car Congress. 2011-05-25. Retrieved 2011-05-31. ^ Valdes-Dapena, Peter (2009-08-11). "Chevy Volt to get 230 mpg rating". CNN Money. Retrieved 2009-08-11. ^ Sharon Silke Carty (2010-07-14). "Chevy Volt 230-mpg forecast dead; feds work on new formula". USA Today. Retrieved 2010-07-15. ^ "Determination of Viability Summary: General Motors Corporation" (PDF). 2009-03-30. Archived from the original (PDF) on 2009-04-07. Retrieved 2009-04-06. ^ Michael Graham Richard (2009-03-04). "GM Fights Back: Volt Battery Pack "Hundreds Less" than $1,000/(kWh)". Treehugger. Retrieved 2011-05-23. ^ Sharon Terlep. "GM exec:Hybrids unlikely to take more than 10% of U.S. market". MarketWatch. ^ "Low Voltage". The Washington Post. 2010-08-01. Editorials. Retrieved 2010-08-01. ^ "Whitacre Talks to The News about Volt, Bailout Critics, More". The Detroit News. 2010-08-06. Retrieved 2012-05-31. ^ "White House: Chevy Volt Pricing Decision Didn't Come From Us". Edmunds.com Inside Line. 2010-07-30. Retrieved 2010-08-05. ^ a b Jonathan Schultz (2010-08-05). "Let the Chevrolet Volt Buyer Beware, as Some Dealers Mark Up Price". The New York Times. Retrieved 2010-08-06. ^ Bill Visnic (2010-07-31). "Chevrolet Dealer: Want a Volt? That'll be an Extra $20K". Edmunds.com Auto Observer. Retrieved 2010-08-06. ^ Mary M. Chapman (2011-06-02). "Over G.M. 's Objections, Dealers Sell "Used" Chevy Volts Without $7,500 Tax Credit". The New York Times. Retrieved 2011-06-02. ^ Tiffany Hsu (2011-06-03). "Chevy Volt dealers inflate prices, take tax credits". Los Angeles Times. Retrieved 2011-06-03. ^ Maynard, Micheline. "Stunner: GM May Be Losing $50,000 On Each Chevrolet Volt". Fobes. Forbes Media, LLC. Retrieved 30 March 2019. ^ Bernie Woodall; Paul Lienert; Ben Klayman (2012-09-10). "GM's Volt: The ugly math of low sales, high costs". Reuters. Retrieved 2012-09-10. ^ "GM Response to Reuters Story on Chevrolet Volt Development Costs". GM News United States. 2012-09-10. Retrieved 2012-09-10. ^ Jensen, Christopher (2011-11-11). "Chevy Volt Fire Prompts Federal Investigation Into Lithium-Ion Batteries". The New York Times. The New York Times Company. Retrieved 2011-11-11. ^ Green, Jeff; Welch, David; Greiling Keane, Angela (2011-11-11). "GM Volt Fire Prompts Probe of Lithium Batteries". Bloomberg. Bloomberg. Retrieved 2011-11-11. ^ Bunkley, Nick (2011-11-25). "Formal Defect Inquiry of Volt Battery Begins". The New York Times. The New York Times. Retrieved 2011-11-27. ^ Tim Dobbyn (2011-11-25). "U.S. opening formal probe into GM Volt fire risk". Reuters. Retrieved 2011-11-27. ^ Bunkley, Nick (2011-12-21). "Tsunami Reveals Durability of Nissan's Leaf". The New York Times. Retrieved 2012-01-02. ^ a b c d Bill Vlasic (2011-12-01). "G.M. Offers to Buy Back Hybrid Volts From Owners". The New York Times. Retrieved 2011-12-04. ^ Chris Woodyard (2011-11-28). "GM offering loaner cars to worried Chevrolet Volt owners". USA Today. Retrieved 2011-11-28. ^ Tom Krisher (2011-12-01). "GM offers to buy back Chevrolet Volts from fearful owners". USA Today. Associated Press. Retrieved 2011-12-01. ^ Paul Ingrassia (Reuters) and Daniel Akerson (General Motors CEO) (2011-12-01). GM may redesign the Volt battery - CEO Akerson (Television news). Reuters: Reuters Insider. Retrieved 2011-12-01. Click on transcript to see the complete text. ^ Grace Macaluso (2011-12-05). "GM clarifies Volt 'buyback'". Ottawa Citizen. Retrieved 2011-12-06. ^ Chrissie Thompson (2011-12-06). "'Few dozen' owners ask GM to buy back their Chevrolet Volts". USA Today. Retrieved 2011-12-06. ^ Jake Holmes (2011-12-06). "Chevrolet Volt Won't Lose Top Safety Ratings During Battery Fire Investigations". Motor Trend. Retrieved 2011-12-06. ^ a b Bunkley, Nick (2011-11-11). "Batteries in Electric Cars Examined After Chevy Volt Fire". The New York Times. Retrieved 2011-11-11. ^ a b c Bunkley, Nick (2012-01-05). "G.M. to Reinforce Battery in Hybrid Car". The New York Times. Retrieved 2012-01-05. ^ a b c "GM makes modifications to Chevrolet Volt vehicle structure and battery coolant system to further protect from delayed electrical fire after severe crash". Green Car Congress. 2012-01-05. Retrieved 2012-01-05. ^ Rogers, Christina (2011-12-06). "House will hold hearings on NHTSA's silence after Volt fire". Automotive News. Retrieved 2011-12-08. ^ Vlasic, Bill; Bunkley, Nick (2011-12-07). "G.M. Re-examines Volt as Safety Concerns Rise". The New York Times. The New York Times Company. Retrieved 2011-12-08. ^ Wald, Matthew L. (2012-06-25). "Accusations of Delay in Disclosing Volt Fire". The New York Times. The New York Times Company. Retrieved 2012-01-26. ^ "Auto safety chief denies sitting on Chevy Volt warnings in heated hearing". Fox News. 2012-06-25. Retrieved 2012-01-26. ^ Terlep, Sharon (2012-06-26). "GM Boosts Volt Defense as Sales Falter". The Wall Street Journal. Retrieved 2012-01-26. ^ "2011 10Best Cars – 10Best Cars". Car and Driver. November 2010. Archived from the original on 2010-11-25. Retrieved 2010-11-24. ^ MacKenzie, Angus. "2011 Motor Trend Car of the Year: Chevrolet Volt". Motor Trend. Retrieved 2010-11-16. ^ "Chevrolet Volt Electric Car is 2011 Green Car of the Year". Green Car Journal. 2010-11-18. Archived from the original on 2010-11-24. Retrieved 2010-11-18. ^ Tingwall, Eric Tingwall (January 2011). "2011 Automobile of the Year: Chevrolet Volt". Automobile Magazine. Retrieved 2010-11-18. ^ Whoriskey, Peter (2011-01-11). "Chevrolet Volt named Car of the Year". The Washington Post. Associated Press. Retrieved 2011-01-11. ^ "Latest Technology Place but Don't Win in this Year's Greenest Vehicles List" (PDF). GreenCars.org (Press release). 2011-02-15. Archived from the original (PDF) on 2011-03-03. Retrieved 2011-02-15. ^ Berman, Brad (2011-02-15). "Chevy Volt Barely Makes 2011 List of Greenest Vehicles". PluginCars.com. Retrieved 2011-02-15. ^ "The 2011 Edison Awards Winners". Edison Awards. Retrieved 2011-04-07. ^ "Ford cleans up at 2011 Edison Awards, Chevy Volt wins Gold [w/video]". AutoblogGreen. 2011-04-07. Retrieved 2011-04-07. ^ Jensen, Cheryl (2011-12-01). "With an Asterisk, Chevrolet Volt Tops Consumer Reports Owner Satisfaction Survey". The New York Times. Retrieved 2011-12-01. ^ "Owner satisfaction - Which cars would owners buy again?". Consumer Reports. Retrieved 2011-12-01. ^ "Kelley Blue Book Announces Inaugural Total Cost of Ownership Award Winners". Kelley Blue Book. 2012-02-08. Retrieved 2012-02-08. ^ "Chevy Volt Tops Consumer Reports Most-Loved Car Survey Again". Reuters. 2012-11-29. Retrieved 2012-12-23. ^ Sebastian Blanco (2015-11-19). "2016 Chevy Volt wins Green Car of the Year". Autoblog Green. Retrieved 2015-11-21. ^ "Chevrolet Volt wins the « Grand Prix de l'Environnement 2009". Chevrolet Europe Media. 2009-02-11. Retrieved 2012-03-08. ^ "Chevrolet Volt Declared 2011 World Green Car". World Car of the Year. 2011-04-21. Retrieved 2011-04-21. ^ Crowe, Philippe (2012-06-15). "Ampera – Volt Duo Wins Green Engine Award". HybridCars.com. Retrieved 2012-06-17. ^ "Green Engine: General Motors 1.4 litre range-extender". International Engine of the Year Award. Archived from the original on 2013-02-05. Retrieved 2012-06-17. ^ "What Car? Green Awards 2011 - Overall Winner". What Car?. 2011-09-07. Retrieved 2012-02-08. ^ Lucas, Paul (2012-10-15). "Vauxhall Ampera scoops another Green Car of the Year award". The Green Car website. Retrieved 2012-12-23. ^ Steen Bachmann (2011-10-12). "Uventet kåring: Opel Ampera er Årets Bil i Danmark 2012". Bil Magasinet (in Danish). Retrieved 2011-10-14. ^ Sebastian Krausing (2011-10-12). "Årets bil i Danmark 2012 - Opel Ampera". Bilsektionen.dk (in Danish). Retrieved 2011-10-14. ^ Huw Evans (2012-03-06). "Volt and Ampera Win European Car Of The Year". HybridCars.com. Retrieved 2012-03-07. ^ Squatriglia, Chuck (2012-03-05). "Chevrolet Volt Named European Car of the Year | Autopia". Wired.com. Retrieved 2013-11-29. ^ Eric Loveday (2013-08-27). "Opel Ampera Beat Tesla Model S and BMW i3 to Win "Green Mobility Trophy 2013″". InsideEVs.com. Retrieved 2013-09-01. ^ "Holden Volt wins Drive's Green Innovation Award". The International News Magazine. 2012-12-07. Archived from the original on 2013-04-19. Retrieved 2012-12-23. Edsall, Larry (2010). Endres, Chris (ed.). Chevrolet Volt: Charging into the Future. Foreword by Bob Lutz (Hardcover ed.). Minneapolis, Minnesota: Motorbooks. ISBN 978-0-7603-3893-3. Fletcher, Seth (2011). Bottled Lightning: Superbatteries, Electric Cars, and the New Lithium Economy (First ed.). New York: Hill and Wang. ISBN 978-0-8090-3053-8. Rafinejad, Dariush (2013). "Chevrolet Volt: A Disruptive Innovation Bridge to Electrified Transportation" (PDF). San Francisco, California: Presidio Graduate School. Retrieved 2013-09-26. 2012 Chevrolet Volt Owner Manual (PDF) (First printing ed.). United States: General Motors. 2011. Part no. 20819515 A. Archived from the original (PDF) on 2013-10-20. Retrieved 2013-10-20. Wikimedia Commons has media related to Chevrolet Volt. Wikimedia Commons has media related to Holden Volt. Wikimedia Commons has media related to Opel Ampera. Wikimedia Commons has media related to Vauxhall Ampera. Wikimedia Commons has media related to Buick Velite 5.